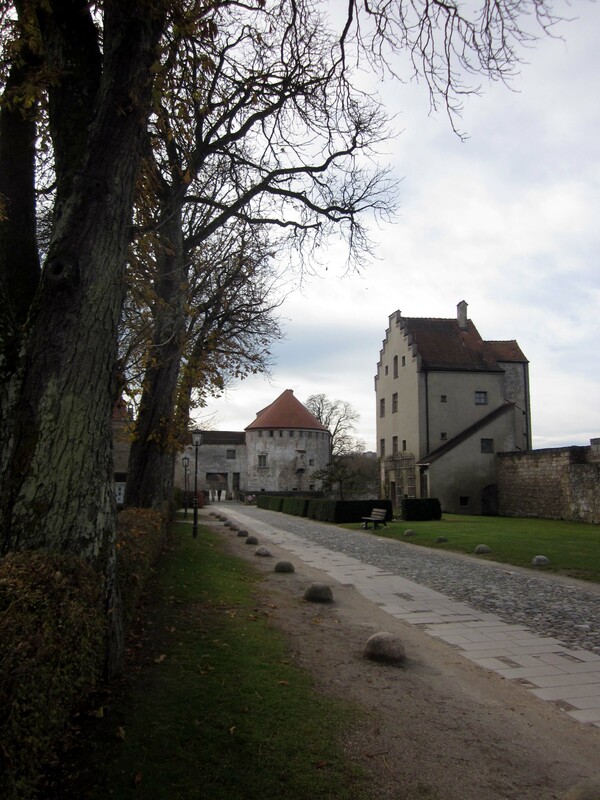 The next day Manuela decided to take us out of Braunau and over to Burghausen, which is a small town in Germany that is also host to the longest castle in Europe. The ride was only about 20 minutes. We were all excited to be in a car for the first time in three months and the winding country roads reminded us all of home. We made a quick stop along the road to look at the view. 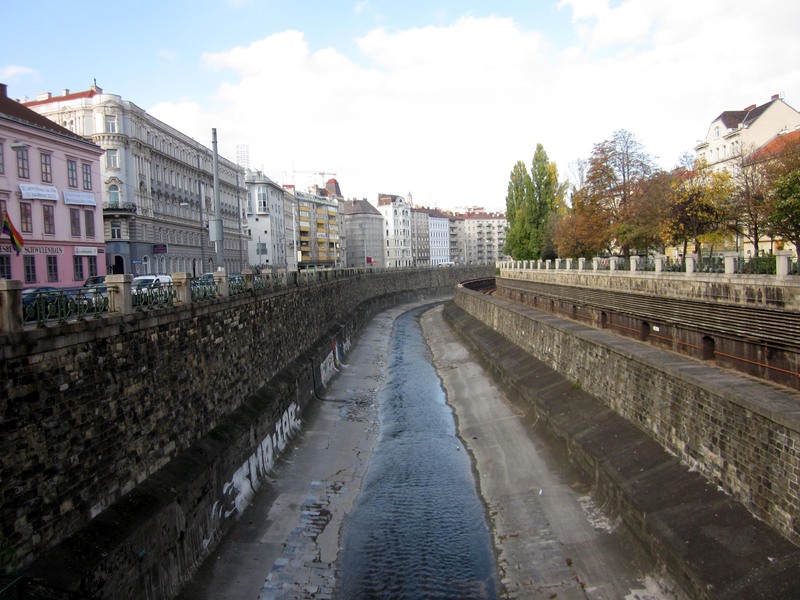 This is where the rivers Inn and Salzach meet. 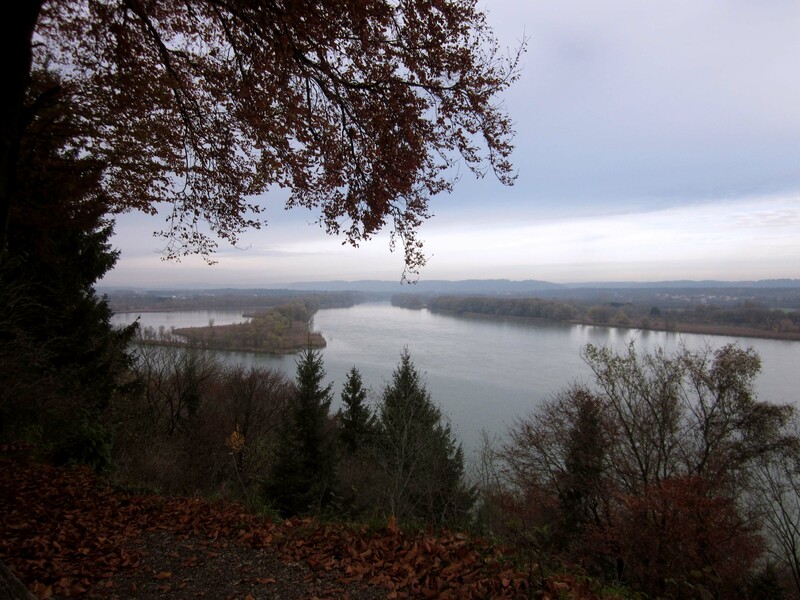 Before actually crossing the border to Germany we stopped at a lookout point. 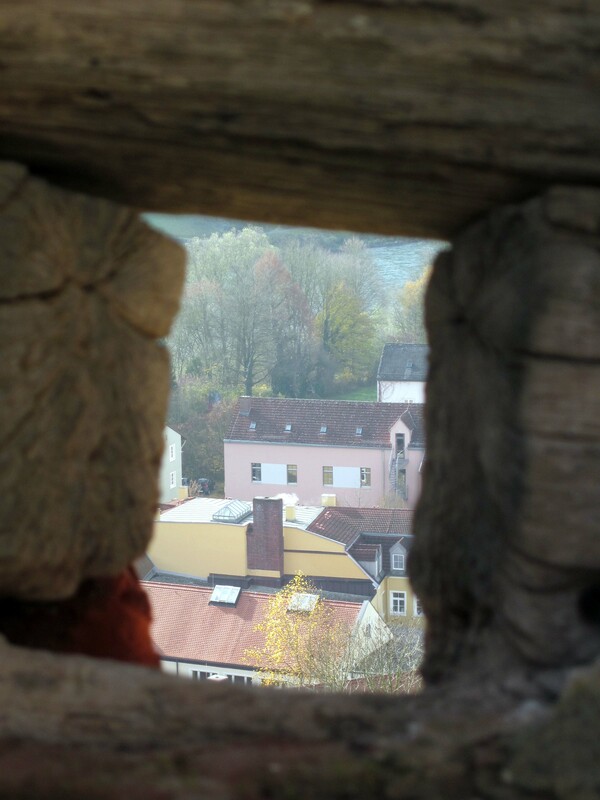 From this vantage point we could see the entire town of Burghausen and the medieval castle, Burg zu Burghausen. 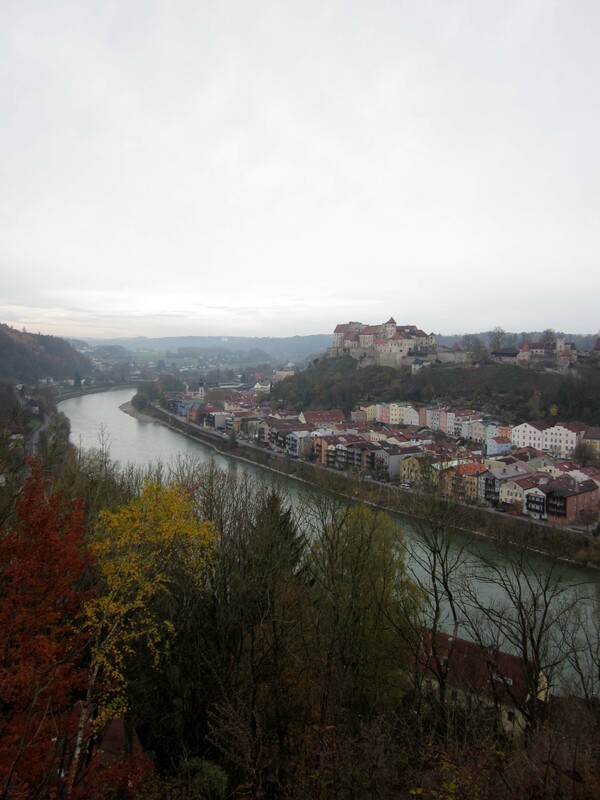 It is situated on the banks of the Salzach, which also separates Austria from Germany. The entire castle is 1,043 m or about 3,422 feet. The actual castle sits atop a hill overlooking the rest of the town nestled below. The entire castle starts from the very right hand side of the picture below and goes until the cluster of buildings on the left side. Inside the castle we parked the car and got out to walk. Much of the castle is actually used for housing. The entire thing seemed more like a little town in itself rather than a castle. It was very long, but not at all very wide. There was only one row of buildings on each side. 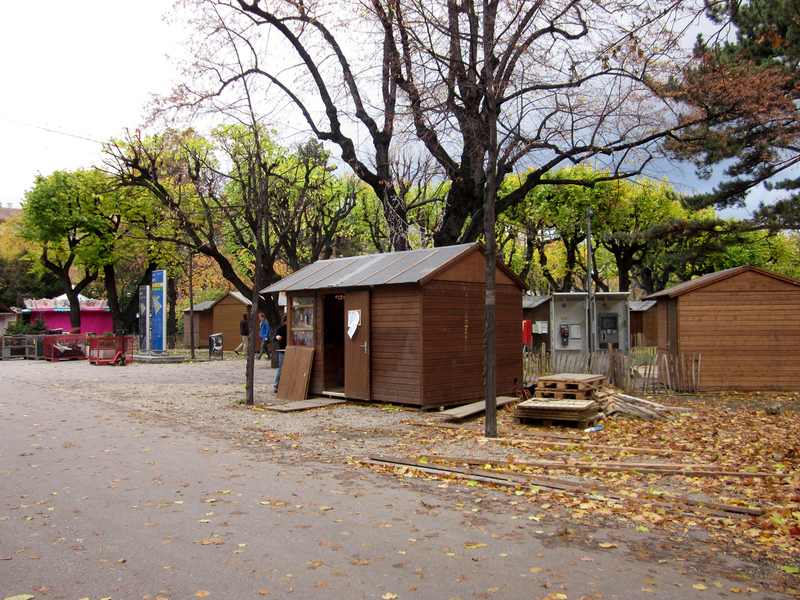 Some of them were homes, but others were restaurants, museums and shops. Manuela told us that every year there is a celebration and people dress as knights and ride horses around on the castle grounds. 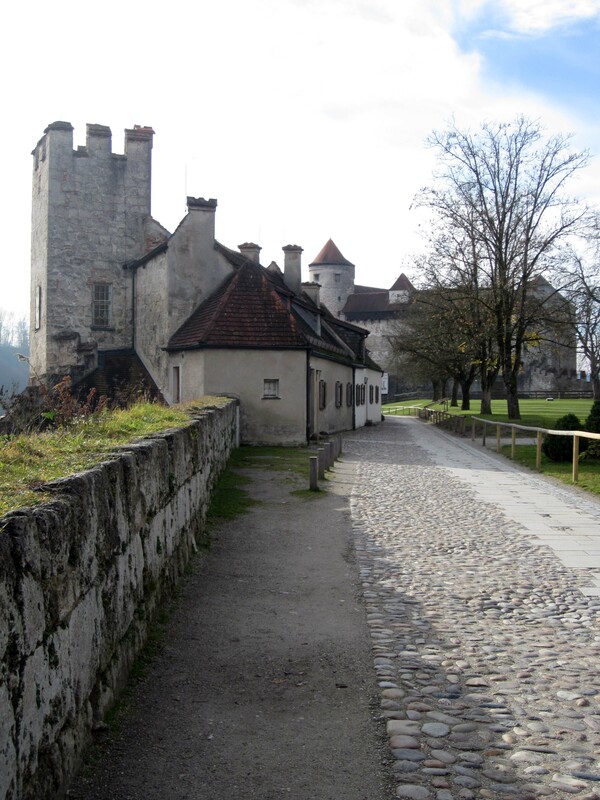 The path to the castle. An example of the cute homes in the castle. My favorite part of the castle was the red roofs. 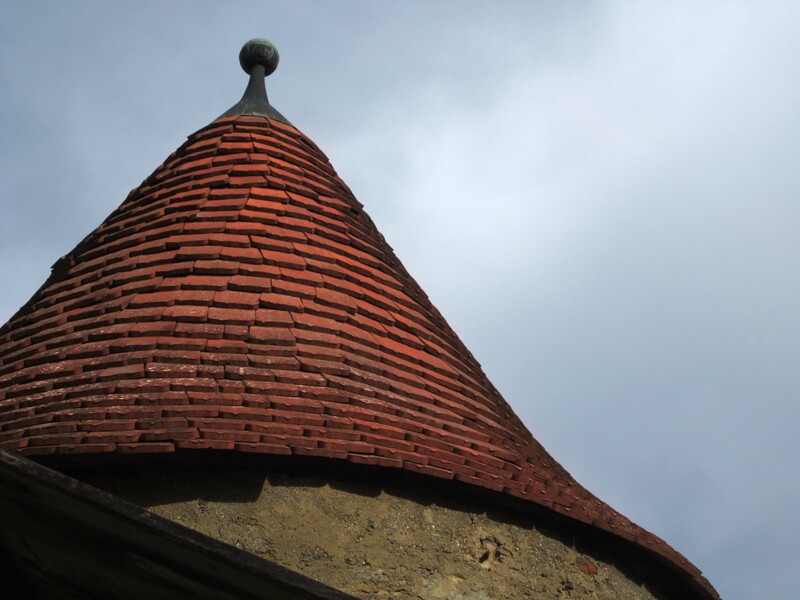 Each building was topped by a cone and bright red tiles. The walls surrounding the castle had a number of holes in them for shooting arrows at approaching enemies. The garden path, which runs along the outside of the courtyard. 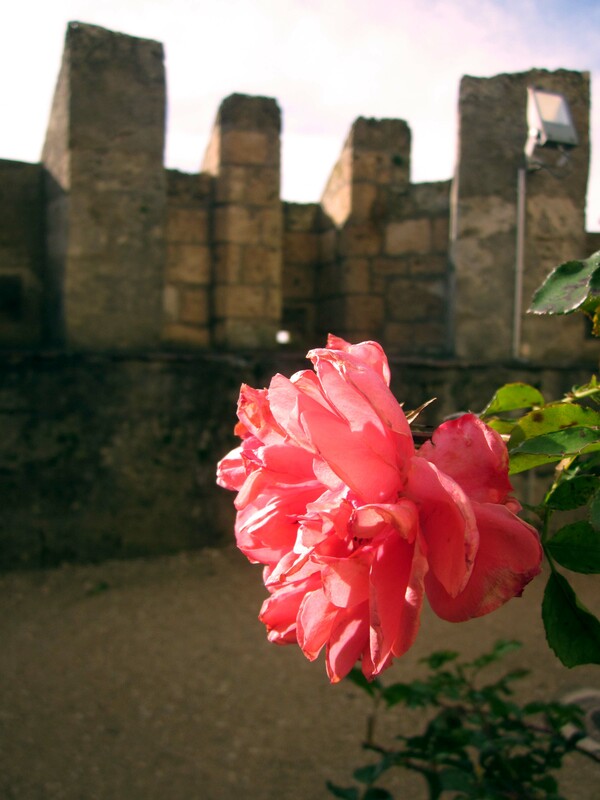 There were still a few last roses clinging to the side of the castle walls. They reminded me of all the stories of beautiful princesses and daring princes I read as a kid. To get to the castle we walked trough the center of the town, but on the way back we walked along the outside of the walls and then stopped at one of the restaurants to warm ourselves up. This particular restaurant played some of the best music I’ve heard in a long time, from “Wake Me Up Before You Go Go” by Wham! to “You’re the Voice” by John Farnham. The restaurant was definitely stuck in the 80’s. Our former German assistant, Manuela, lives in Austria, so we decided to visit her since we are so close. 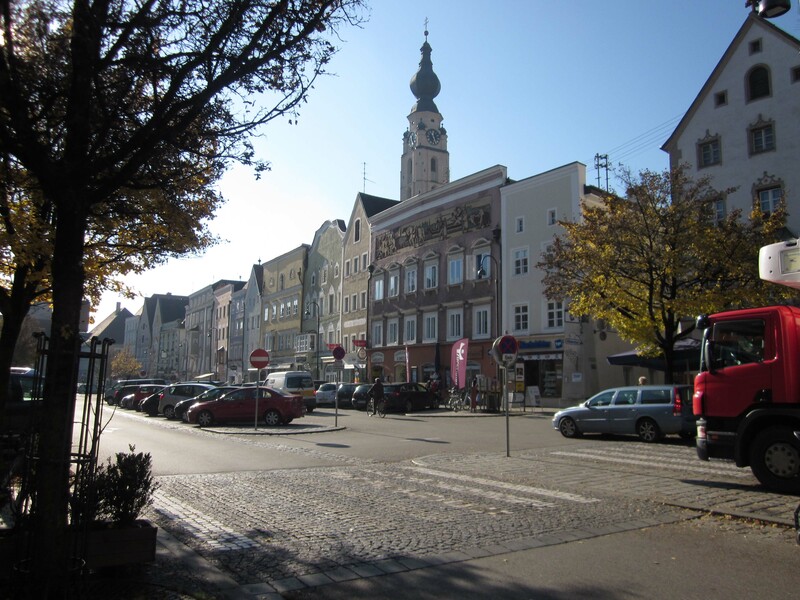 She lives in Braunau am Inn, which most people probably know as the birthplace of Hitler, but it is something that the town obviously doesn’t want to advertise and it’s not a good reason to go and visit the town. 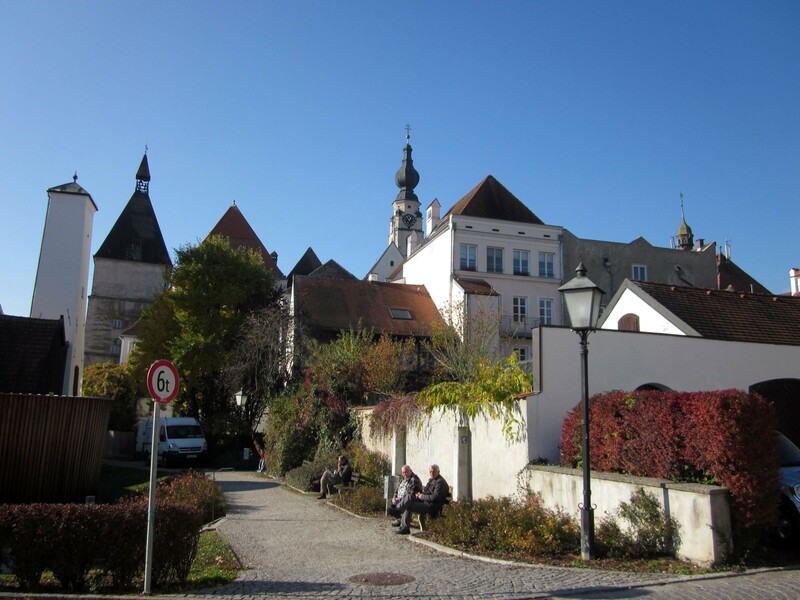 What people should visit Braunau to see is its homeliness, small-town feeling and to see how the average person lives in Austria. 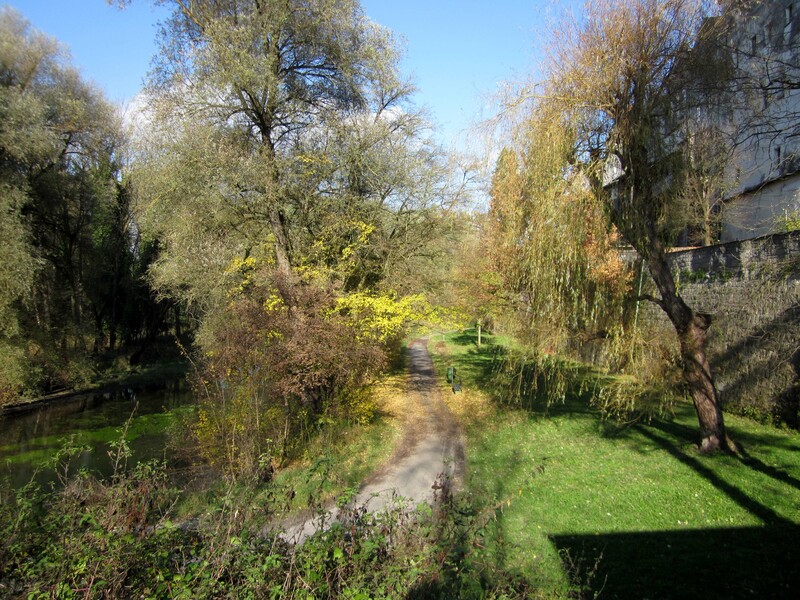 The town is called Braunau am Inn, because am Inn, means “on the Inn River”, which runs right next to Braunau and separates it from Germany. When we arrived Manuela was working, so we walked from the train station to the main part of town, which amounted to about a ten minute walk. Stepping off the train and breathing in fresh country air was really relaxing. Everything seemed so quiet and peaceful compared to the city. 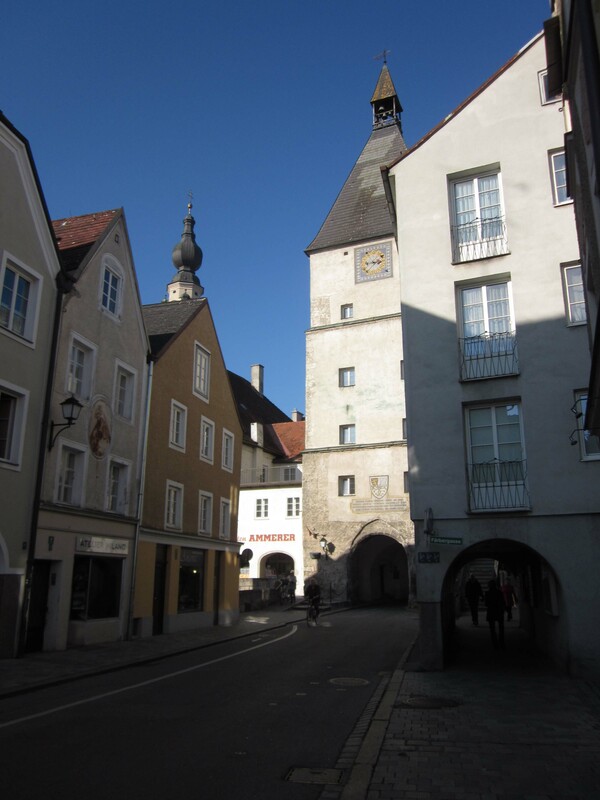 When we arrived at the main street, called Stadplatz, we were surrounded by colorful, cute buildings and shops. There was hardly anyone on the street so we sat at a bench and just enjoyed the sun. Once her work was finished, Manuela met us and then proceeded to give us a tour of the town. Braunau is right on the border of Germany, so of course we had to make our way over to Germany just for the fun of it. We crossed the bridge between Germany and Austria and ended up in the small town of Simbach. 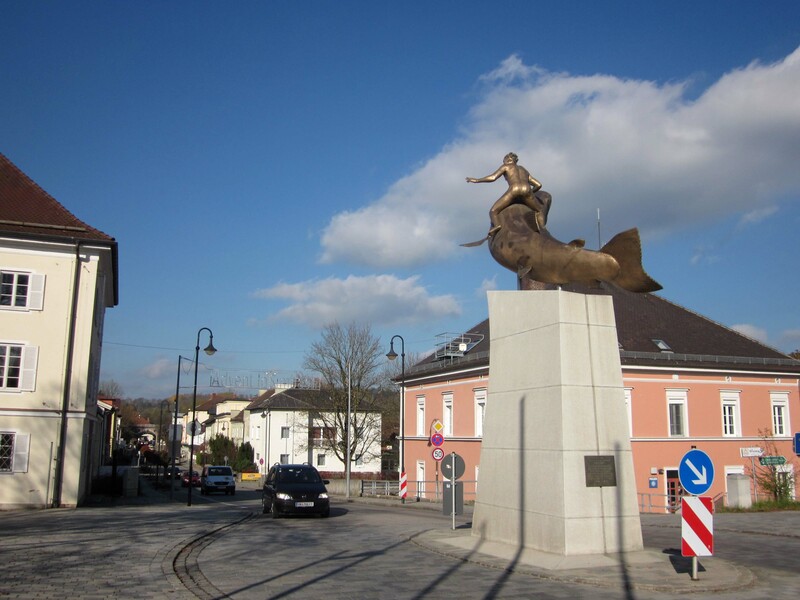 Manuela told us about this statue in Simbach, which is placed right at the end of the bridge when entering Germany. It is a man riding a fish. Originally the man was completely naked, but the residents of Braunau found it offensive to have a naked man’s behind pointed at their lovely home, so they made the artist cover the figure. I’m not really sure if it helped, since it still pretty much looked like he was naked from where we stood, but the people of Braunau seem to be satisfied. 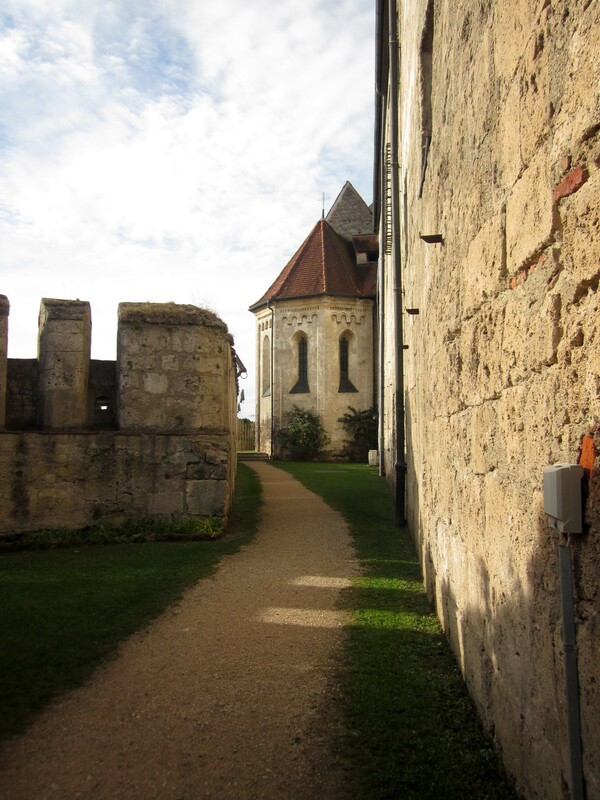 Braunau was founded in 1260 and used to be surrounded by a wall. However, there is only a small portion of this wall left. 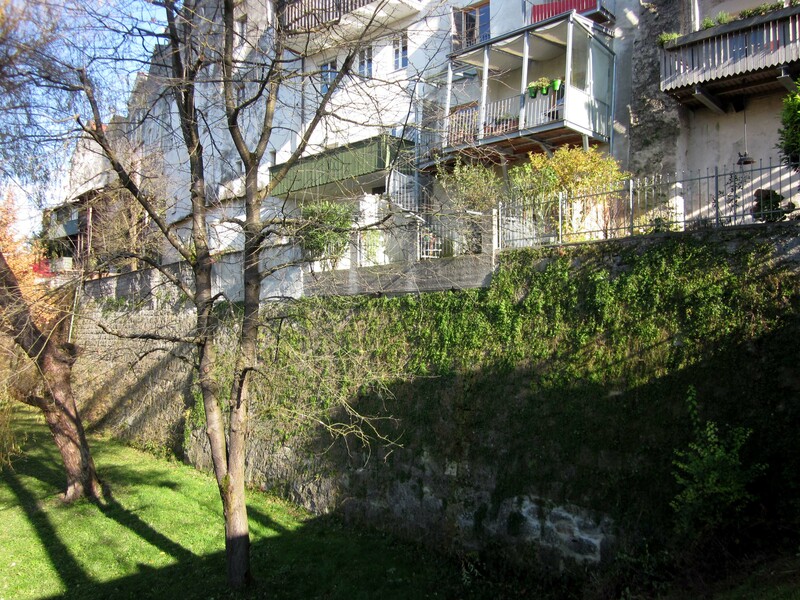 Part of the old wall close to the Inn. Directly next to the wall is a small walking path that cuts through the forest. 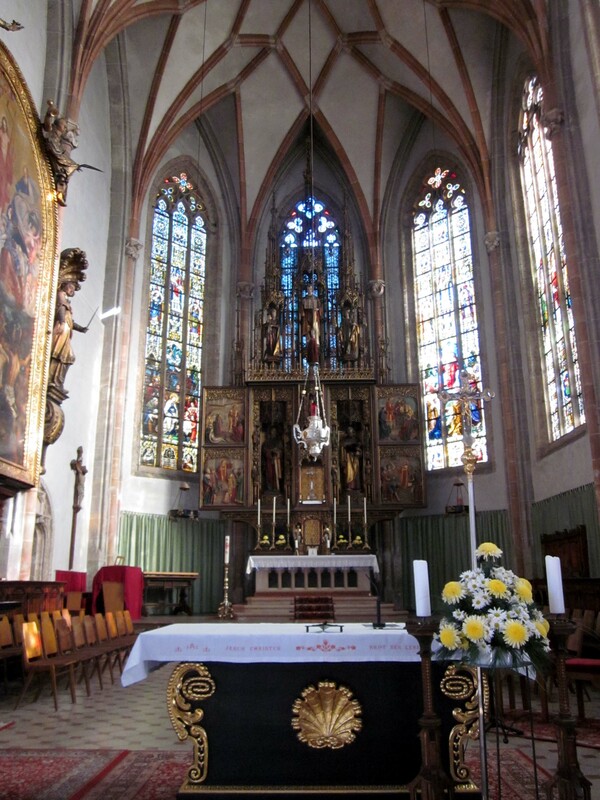 We were then lead to the Church of St. Stephan’s, which is one of the main churches in the town. 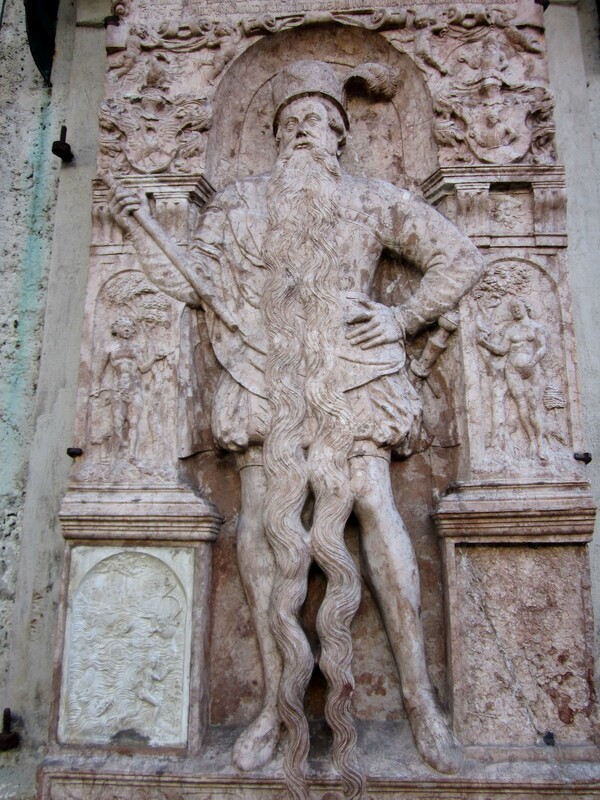 On the outside of the church is a carving of one of the old town leaders Hans Staininger, or as many know him, “the man with the very long beard”. He did indeed have a very long beard, but it was his beard that eventually killed him. One day he forgot to tuck his beard in his pocket while going down the stairs and he tripped and fell, breaking his neck. Perhaps such a long beard was not the best of ideas, but it sure made him look awesome. These particular seats have rounded edges that stick out. 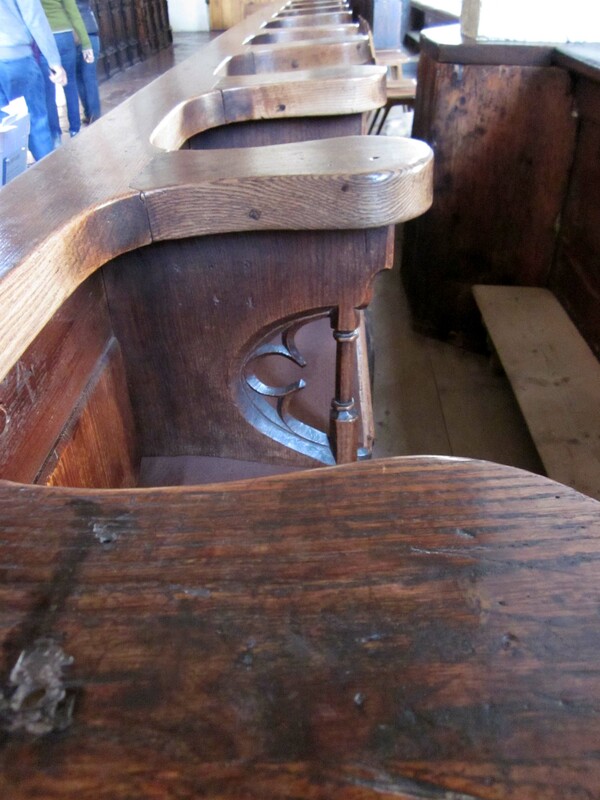 This was originally used to keep people from falling out of their seat if they fell asleep while at church. When someone would fall asleep they could slump forward, but the arms of the chairs would catch them and keep them mostly upright. 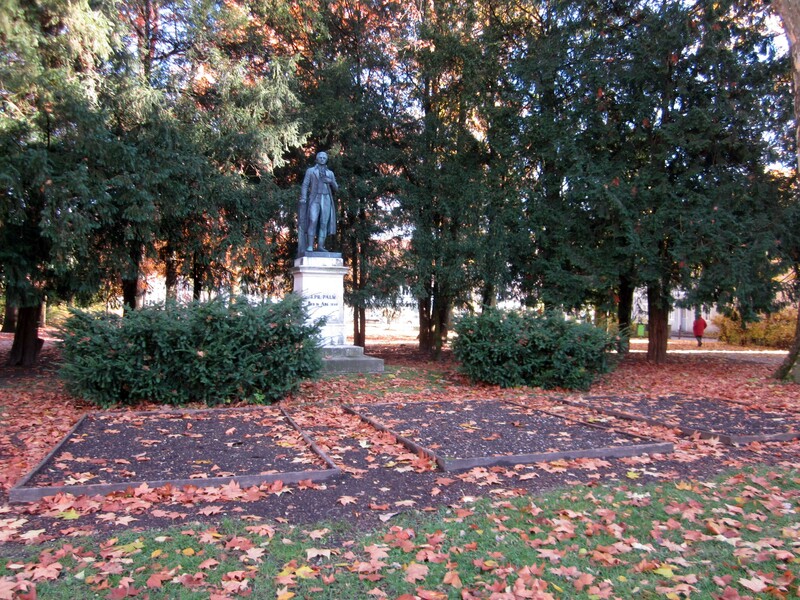 There is a small park in Braunau dedicated to Johann Philipp Palm. He was a bookseller, but he wrote some things that Napoleon didn’t like and so Palm was imprisoned and then executed for his writings. While walking through town, we came to the Painters’ Quarter. It’s called this because many artists love to come to this spot and paint the many different rooftops. Addision, Ari, Annika and I all had our cameras out and were taking a million pictures. The old men in my photo were watching us. We were probably the only tourists in the entire town. 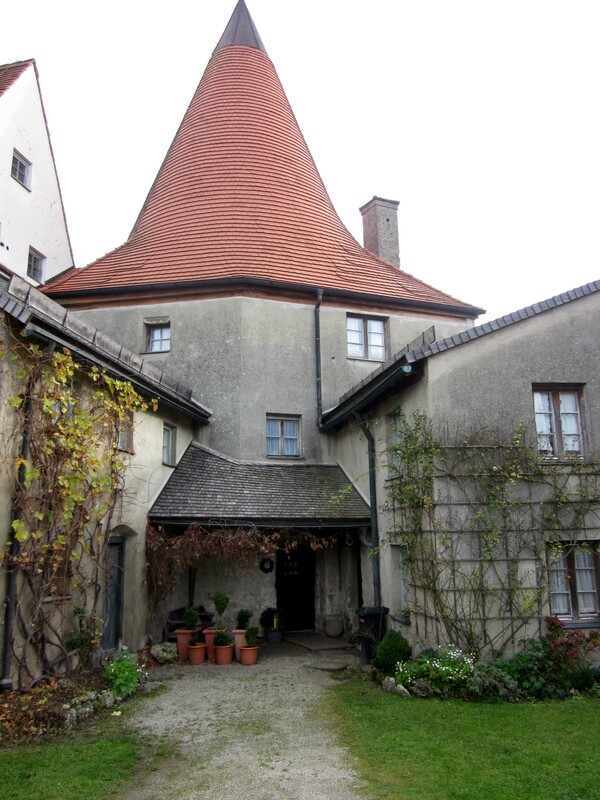 We stopped at Hitler’s birth house, but it wasn’t really anything special and looked like any normal building. There is a memorial out front, which I thought was a nice, but subtle way of working with the house without making the house itself into something. The stone of the memorial is made out of granite from the former concentration camp, Mauthausen. Next we arrived at one of the town towers. It is the only tower still remaining of the original five. It is the town’s oldest building and was built during the time that the town was founded. After our tour we headed to Manuela’s family house for lunch. Her mother had made us pumpkin soup, which is very popular in Austria. After having lunch we were taught how to make apple strudel. It’s actually really simple and fun to make. 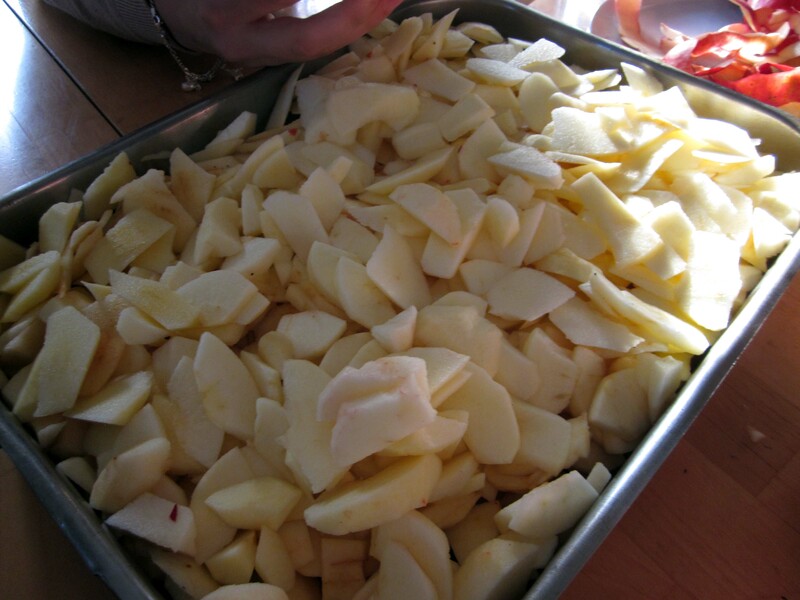 First we made the dough and then we began cutting the apples. Manuela’s mother was super fast! She had already done five, while I was still working on one. I have to admit cutting apples is not my forte. Out of all the apples below I probably got through three before they were all finished, but I didn’t cut myself! After cutting the apples we rolled out the dough, placed the apples inside, added two types of sugar and raisins and then rolled it all together. It took maybe a half hour to cook and then we added vanilla sauce and ice cream! 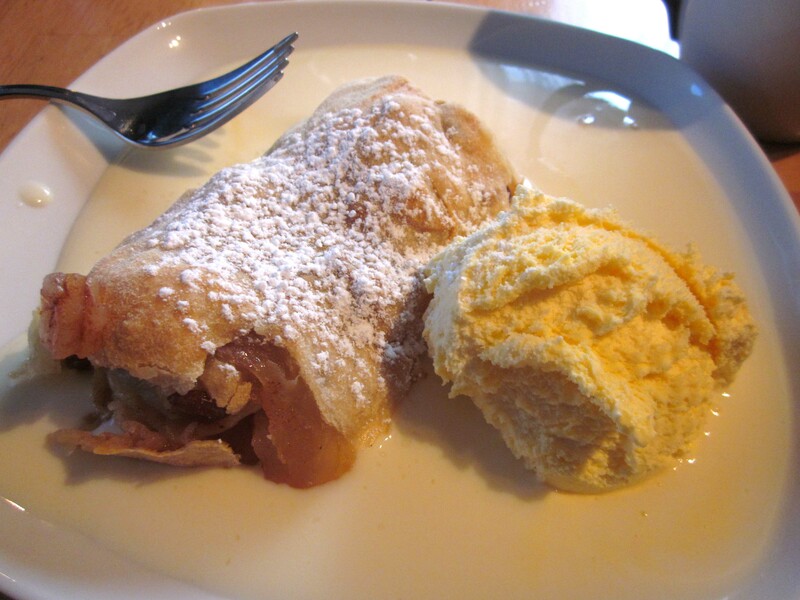 It was the best apple strudel I’ve had so far! 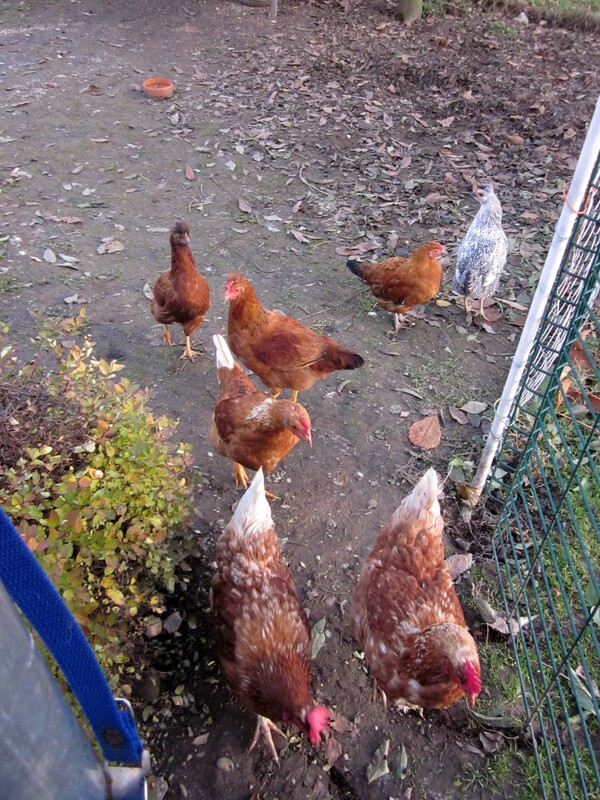 While waiting for the strudel to cook we went outside and fed Manuela’s chickens. Only two of them were old enough to produce eggs, the rest were still too young. They tried to escape when we entered the pen, but once they saw that we had food, we were the center of attention. Manuela told us that they left them out everyday and they wandered the town, eventually coming back in the afternoon for shelter and food. We said fairwell to Manula’s mother and then headed over to Manuela’s house where she lives with her fiancé. It was a nice little home, with just enough room for us all to sleep in the main living room. She introduced us to her rabbit, which Addison fell in love with and we took a break until heading over to dinner and the movie theater to watch Skyfall in German. Skyfall was great, even when I couldn’t understand half of it, but it was really strange to listen to a well-known actor like Daniel Craig and hearing the wrong voice. My host mother told me that people here hardly ever hear the real voice of the actors, because they always get the same people to dub the same actors. It makes sense, but it was something I never thought of before. 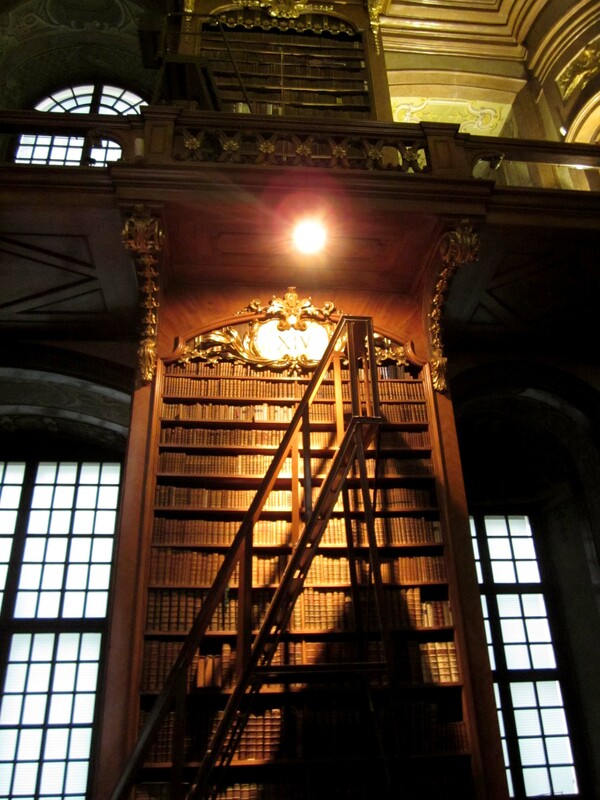 We went to the Österreichische Nationalbibliothek or Austrian National Library one day for class. This is the library that resides in one section of the Hofburg Palace. Part of it is very old and only used as a museum of sorts, but the rest is used by people in Vienna for their research. It was like a library from out of my dreams, with shelves full of books going all the way to the ceiling, spiral staircases and secret rooms full of even more books! 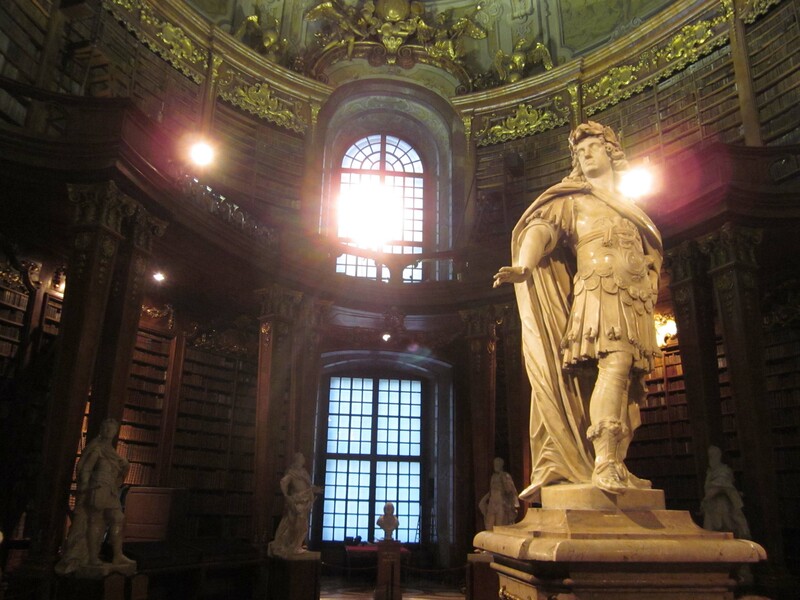 The National Library was built in the Baroque style and by Charles VI, the last Habsburg man and father of Maria Theresa. He created a rule called the Pragmatic Sanction that allowed Maria Theresa to take his place, because he could not produce any male heirs. After his death the Habsburgs become Habsburg-Lorraine. 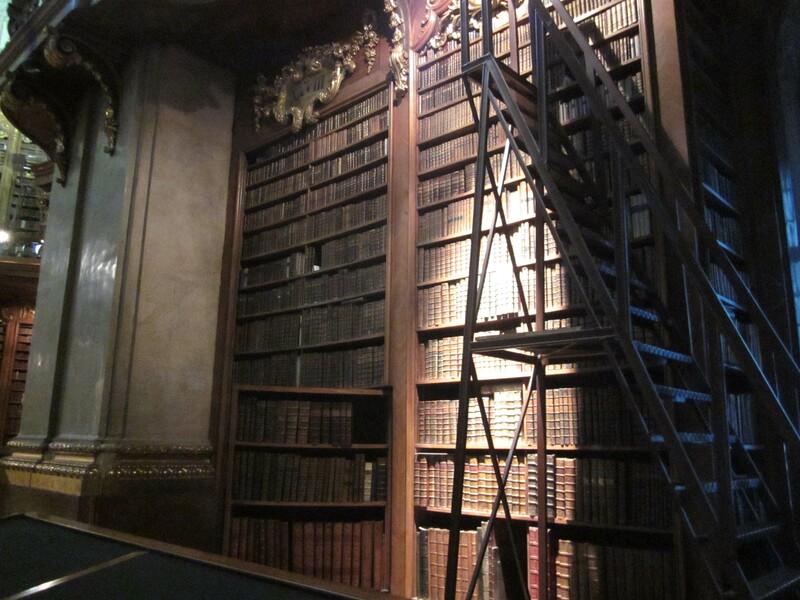 The bookshelves were so high that ladders are needed to reach the top. 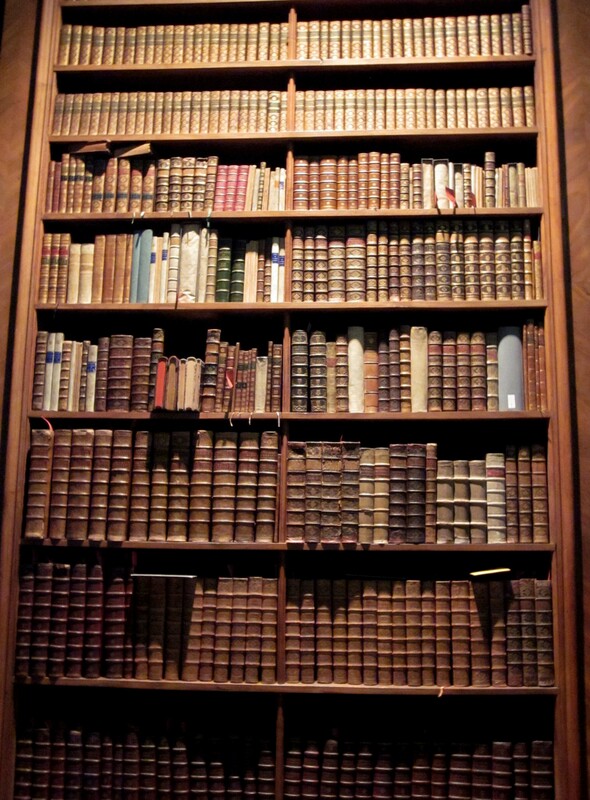 The books are so old that the pages have turned dark brown. Everything is hand printed and many of them have beautiful illustrations with the boldest colors I’ve ever seen. We were lucky enough to have our professor there who knew one of the tour guides personally, so we got to see some of the books close up. The covers are also made out of wood. There were secret rooms all throughout the library. They are not actually supposed to hide anything though.The room was built in an oval shape, but the building itself is square so they had extra nooks to fill in. 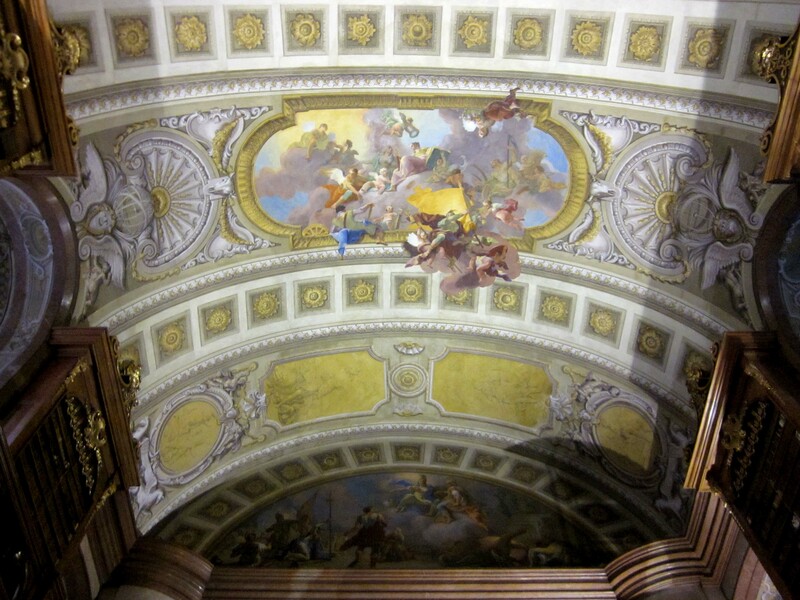 The ceiling at the entrance to the library. The domed ceiling of the central part of the library. A statue of Charles VI, which stands in the middle of the library. After we looked around the old library our guide took us underneath the Hofburg to reach the new section of the library. 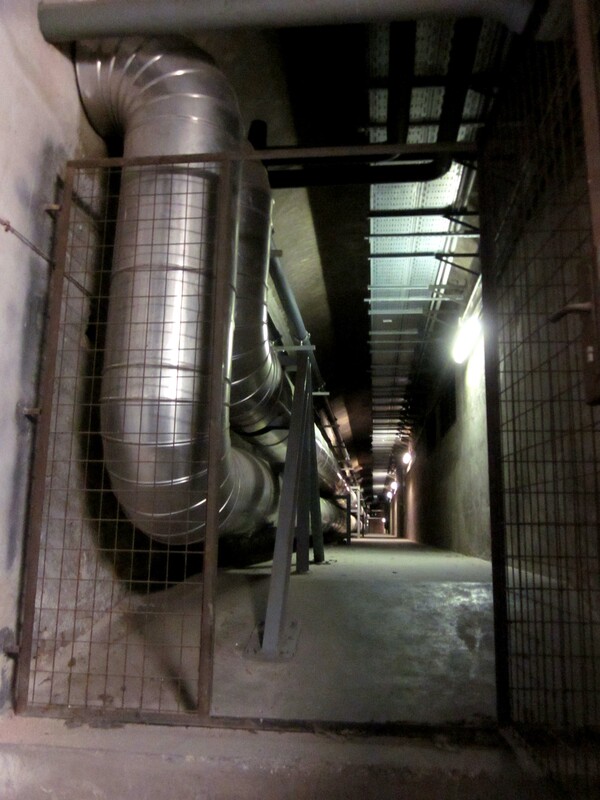 I felt very official walking through all the secret underground tunnels and using the non-public elevator. We walked by the ventilation system for the library, which is underneath a garden. 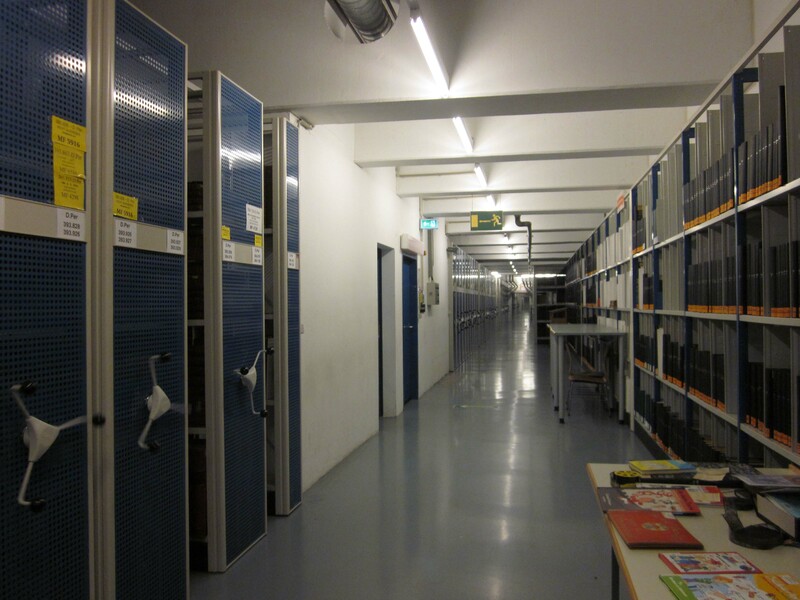 The never ending archive room. I have two ten-page papers due at the end of my semester. One of them is about the Turkish sieges on Vienna, but the other one is on Art Nouveau and specifically the Art Nouveau movement in Vienna. Since I’m right in the middle of one of the most artistic cities in Europe it was easy for me to simply walk outside and do my research through sightseeing. 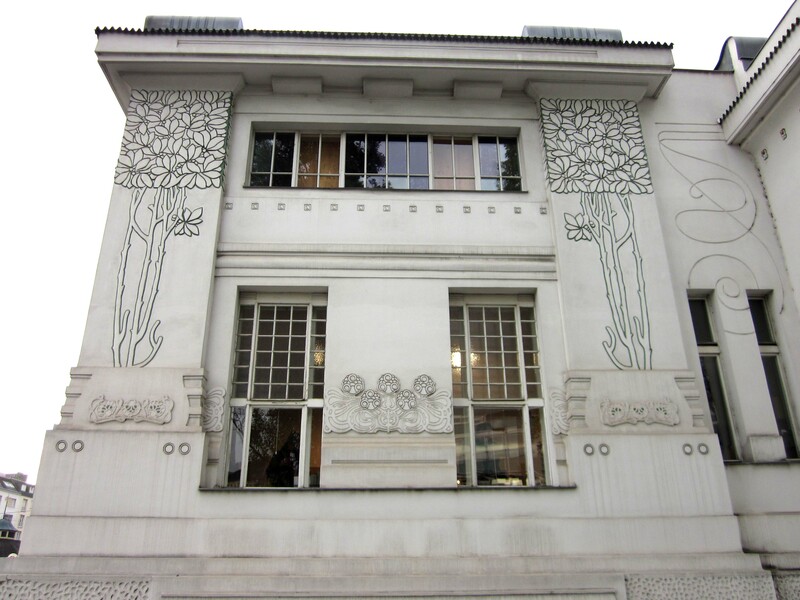 The Art Nouveau movement in Vienna was specifically called the Secession, because a group of artists left the Künstlerhaus. They believed it was too restricting. In this group was Koloman Moser, Joseph Maria Olbrich and most famous of all Gustav Klimt. 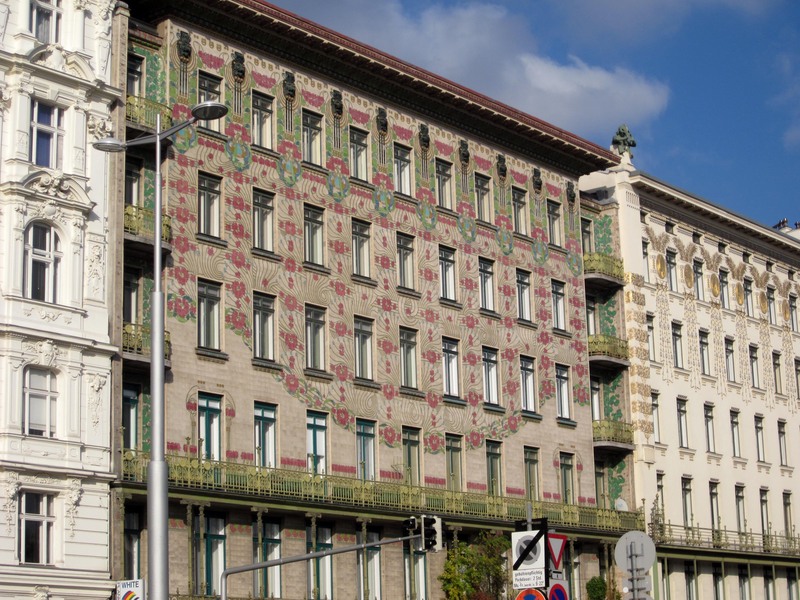 Later Otto Wagner would join the movement a little later, but he was also a large player in the movement. 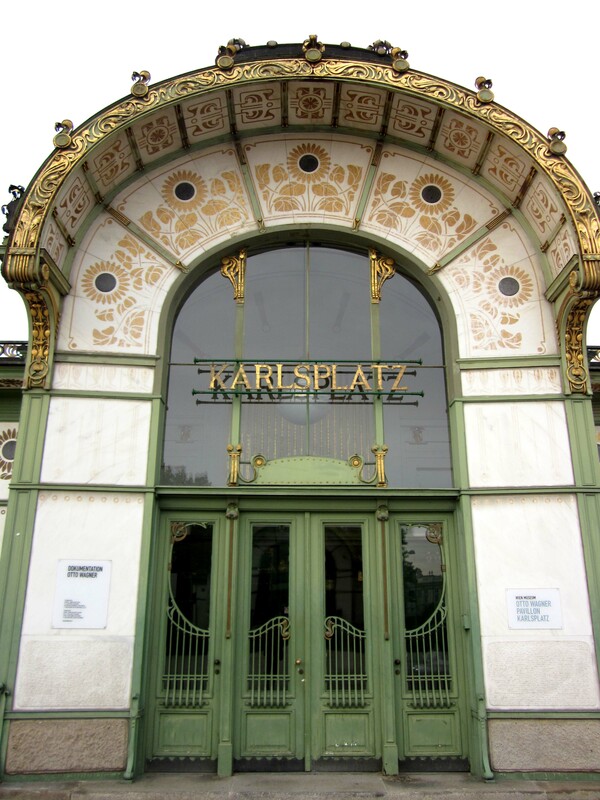 The first place I visited was the Karlsplatz station, which was built by Otto Wagner. 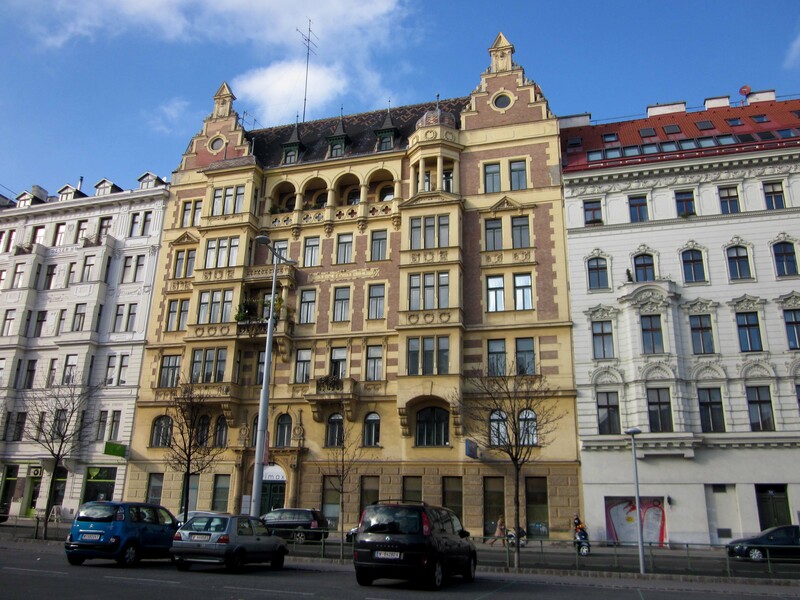 He is responsible for a lot of different buildings in Vienna and he also worked on the Ringstraße. Karlsplatz is one of the larger U-Bahn stations in Vienna. This particular exit is not used too often, but it is really beautiful and probably the most artistic of the Karlsplatz stations. 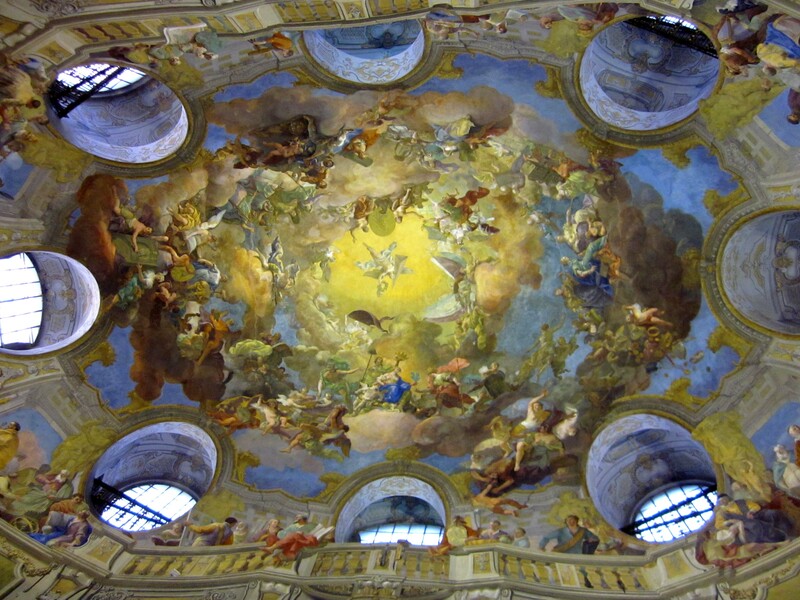 Its name comes from the Karlskirche (Charles Church), which is only about two minutes from here. 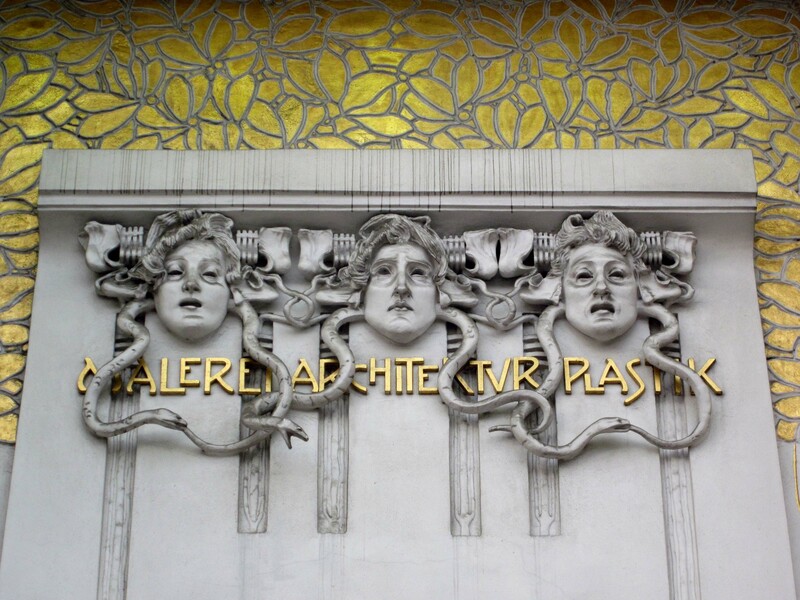 Gold, nature and swirling patterns some basic themes in Art Nouveau. This actually looks like the front, but it is the back of the station. No one can exit through these doors from the U-Bahn. 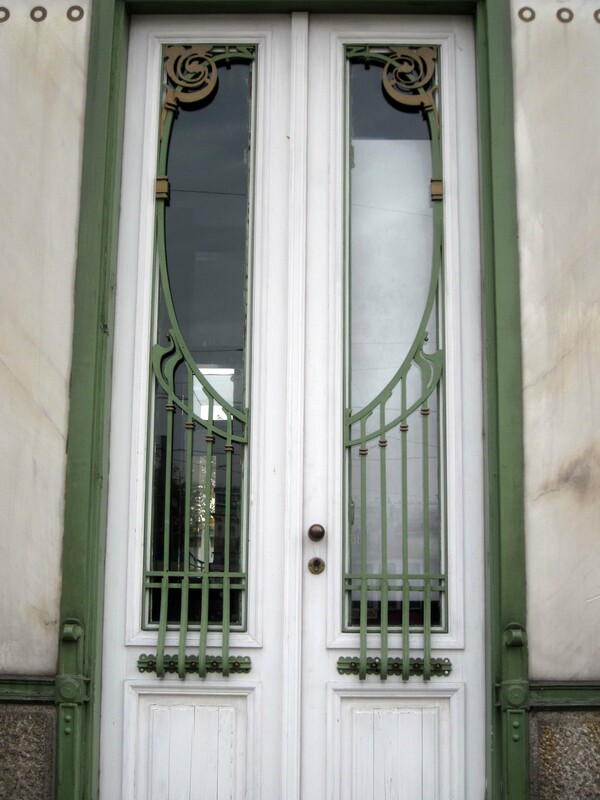 One of the doors. I love the attention to detail. Its simple yet beautiful. 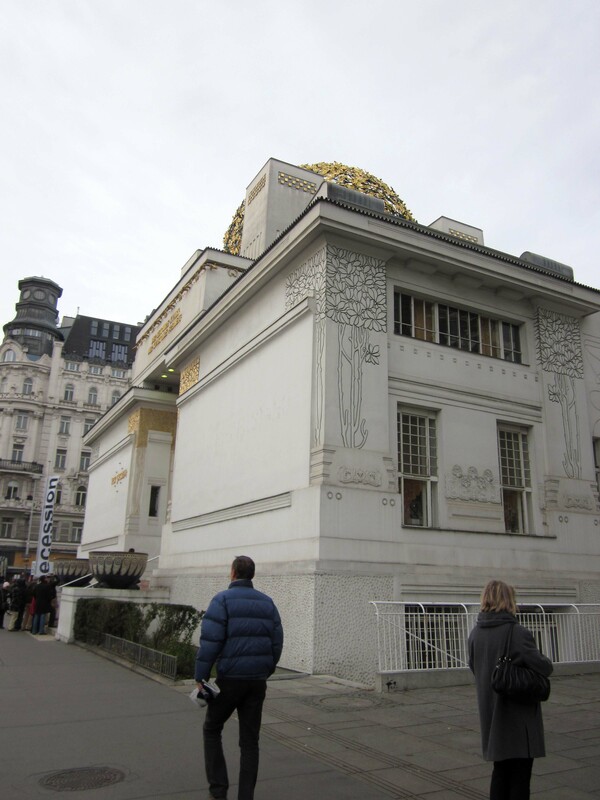 Next I headed over the the Secession building, which was built by Joseph Maria Olbrich. At one point in his life Olbrich worked under Wagner and many of his buildings are similar to Wagner’s own work. 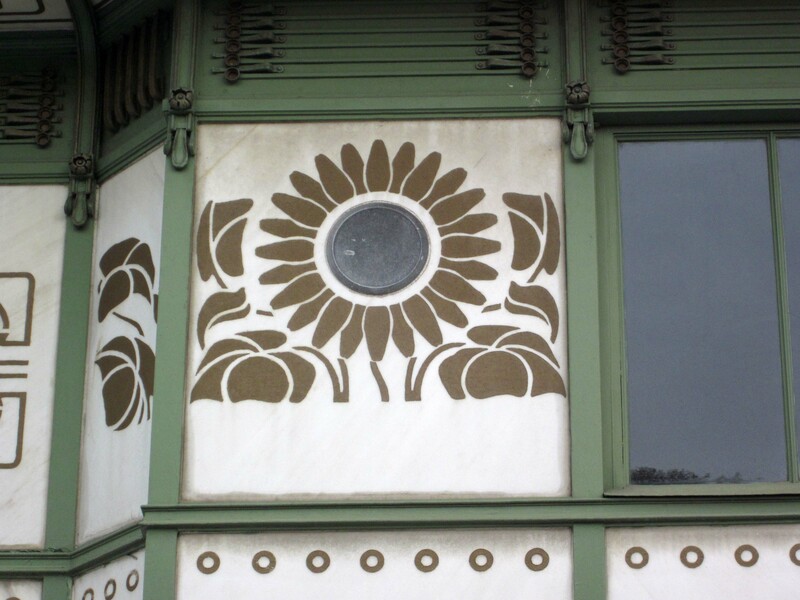 Olbrich built the Secession building specifically so that the artists had a place to exhibit their work. 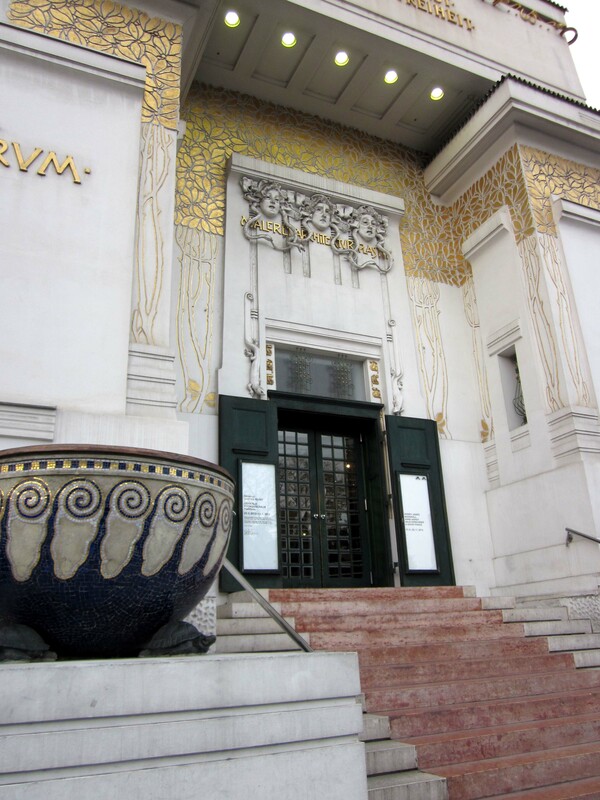 Today it still hosts exhibits and has one of Gustav Klimt’s famous works, the Beethoven Frieze. Many people hated it when it was first build, because of the golden ball on top. They called it a cabbage or a furnace. Personally, I think it looks cool on its own, but I was surprised by it the first time I saw it, because it doesn’t look like anything else in the area. Olbrich built this building as a “temple to art” so the entrance is very ceremonial, but inside the building is completely white and plain. This was because the Secessionists believed in functionality over form. The three heads over the doorway. They are the three Gorgons, representing painting, architecture and sculpture, which are the arts that the Secessionists mastered in. 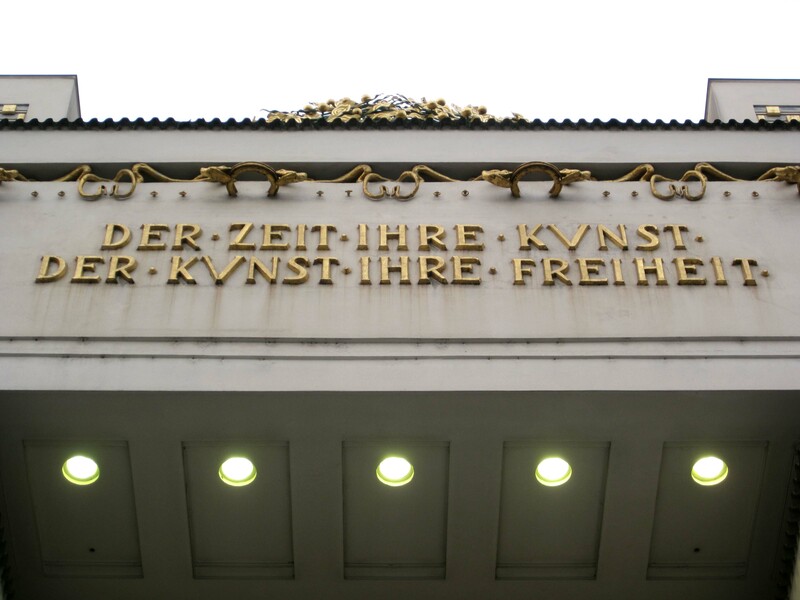 Above the Gorgons are the words of the Secessionist’s motto, Der Zeit Ihre Kunst, Der Kunst Ihre Freiheit. The side of the building. 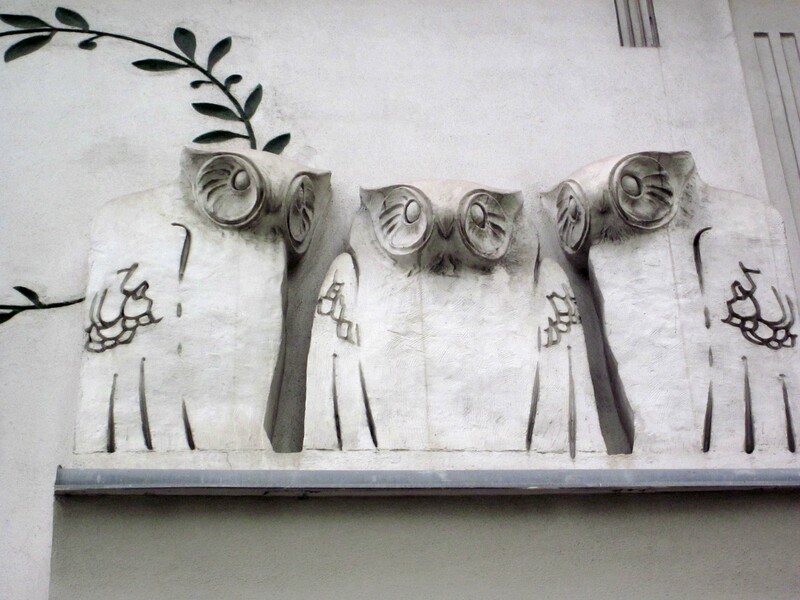 Owls on the side of the Secession. 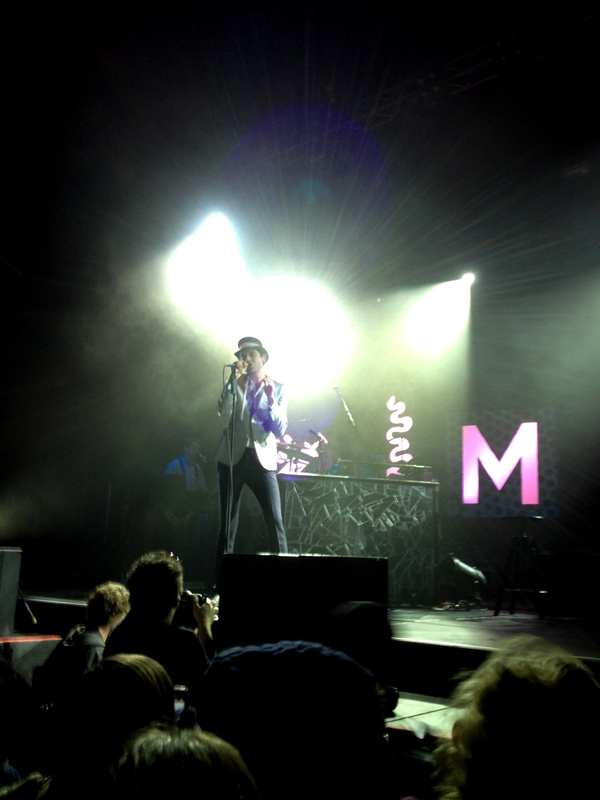 It was a monday night, but Ari, Annika and I still decided that it was worth it to go to a concert by Mika. We traveled a long way from the center of the city to a place called the Gasometer. The Gasometer is actually one of four old gas tanks, which the city used to store gas. They were shut down a while ago, but now they are used for student housing, movie theater, shopping, restaurants, and a concert hall. Our tickets had no seat numbers so we knew we had to arrive early to get a good standing place. We stepped right off the U-Bahn and there was the Gasometer, but the map was really confusing and we spent about a half hour trying to figure out how we could get to the concert hall, which was ground-level. All the elevators inside the building were closed or locked, so eventually we had to make our way back outside until we found the ground floor entrance. By the time we got there the line was long, but nothing that we were worried about. 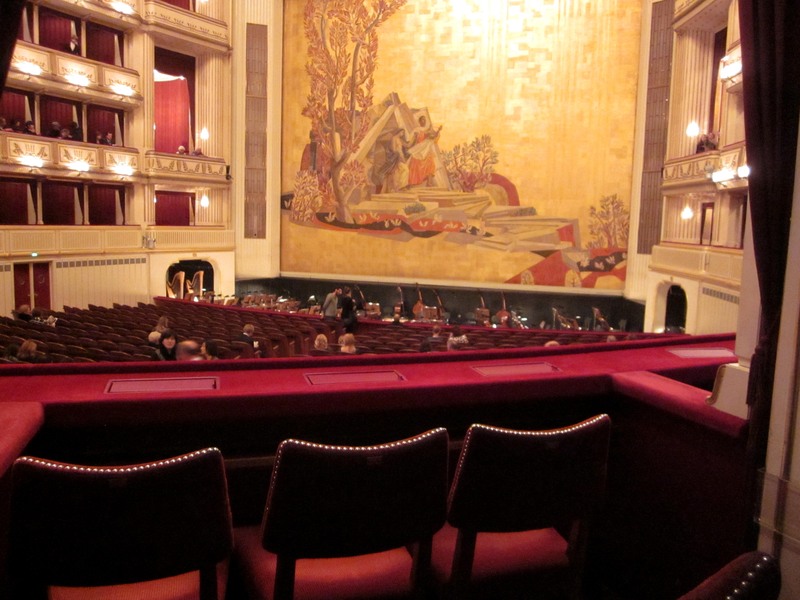 Once inside we headed straight to the concert hall and stationed ourselves right at the front. Lucky for us there weren’t that many people there yet and we were only two people back from the stage. 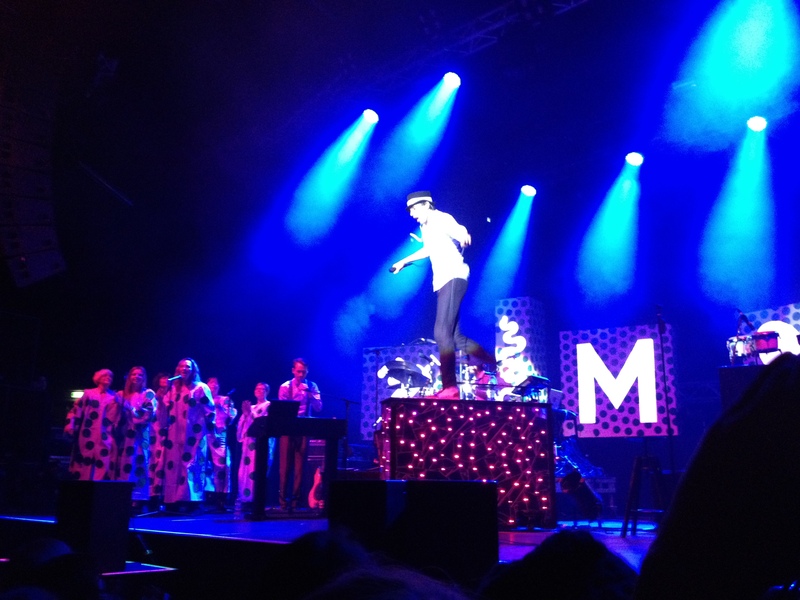 Mika had a backup choir dressed in these horrible polka dot sheets. He said something about the choir only having rehearsed with them once. Sometimes he would look at them and laugh, because they were dressed so ridiculously, but they were having fun dance and acting along with Mika’s crazy performance. I always worry that the bands I go see won’t be as good live, but so far they haven’t let me down! 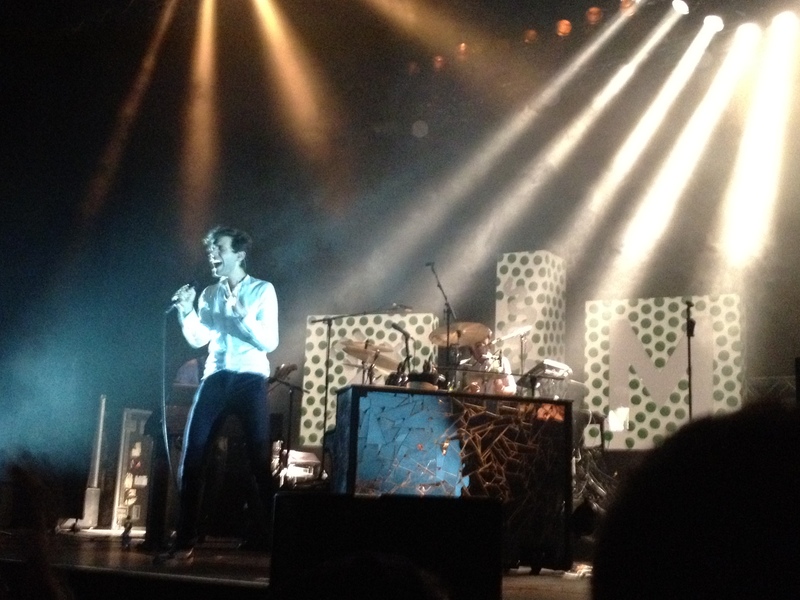 The concert was really amazing, and what I liked about it most was the fact that Mika was so informal. He was constantly changing the set list, which probably made his new band a little nervous, but if they made a mistake he would joke around with them. It was really refreshing to see an artist that doesn’t take himself too seriously. He was constantly jumping around stage and dancing like he was just enjoying life and couldn’t care less what people thought. Annika probably has the best description of him, she called him a “mischievous elf”. It was a great night and although we were tired the next day it was worth every minute. 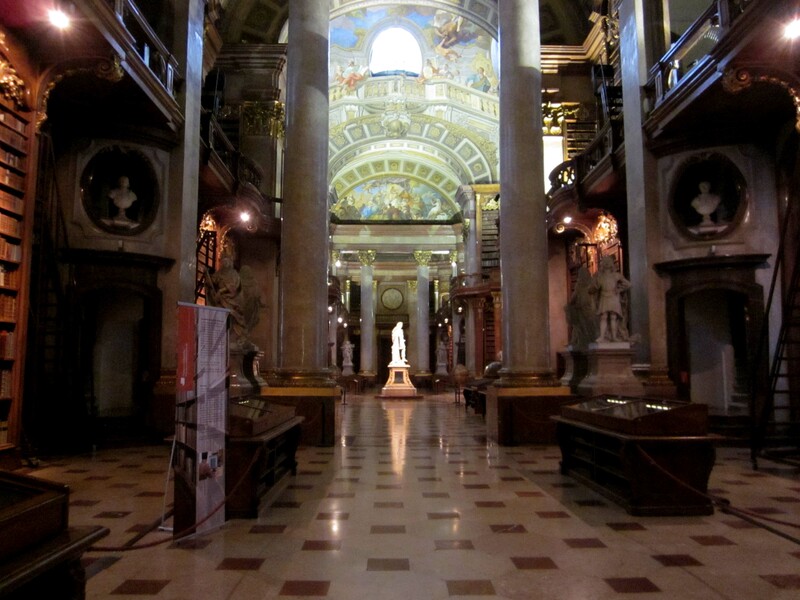 It’s been months since I went to the Imperial Crypt of the Habsburgs, but I returned to it one day with my class. This time I knew a lot more about the different people buried there after learning about basically every Habsburg that was ever important. 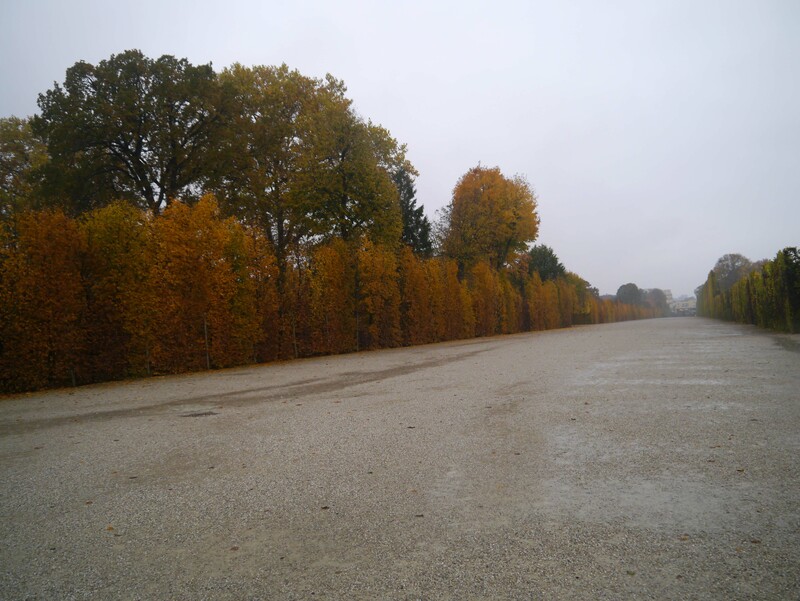 The rituals of the Habsburg’s burials were very important. Whenever one of them died, the heart was removed as well as the organs. These are stored in the crypt in St. Stephens. Although, the hearts are placed in different places depending on what each individual Habsburg wanted. They would also drain them of blood and fill their bodies with sawdust or other concoctions, which differed depending on the person who was preparing the body. There is also a ritual that the body must go through to enter the crypt. First the dead are lead around Ringstraße and taken to St. Stephens where Mass is held. Then the body is transported to the crypt. Outside the many names and titles of the deceased are listed off, but the body is not allowed to enter. Slowly the titles are reduced until it is only the deceased’s name and yet they are still not allowed to enter the crypt. Finally, the name of the deceased is reduced to simply, “a dead man” and they are allowed to enter the crypt and in turn enter death just as they had entered the world. The sarcophagi are made out of tin and often have to be restored or else they warp. Inside the sarcophagi are wood coffins. The first part of the crypt is very different from the last half. 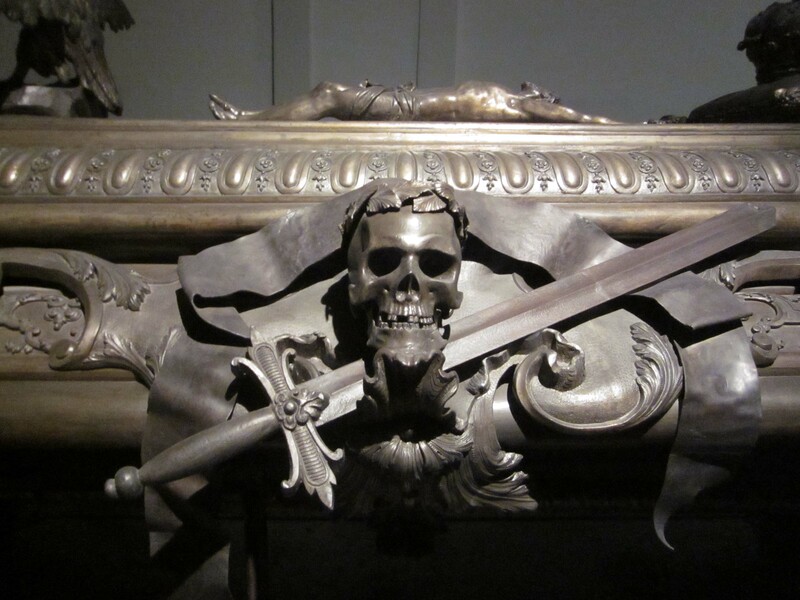 This is because the coffins in the first half were built during the Baroque period and therefore they are adorned with entire figures made out of tin, while the most recent coffins, in the last part of the crypt, are simpler and made only a few years ago. The front of Leopold I’s sarcophgus. He was one of the Baroque emperors and was ruler of the Habsburg lands during the 1683 Turkish siege. He spent most of his life fighting, but is said to have been a peace-loving man. The skull and leaves stand for victory over death. 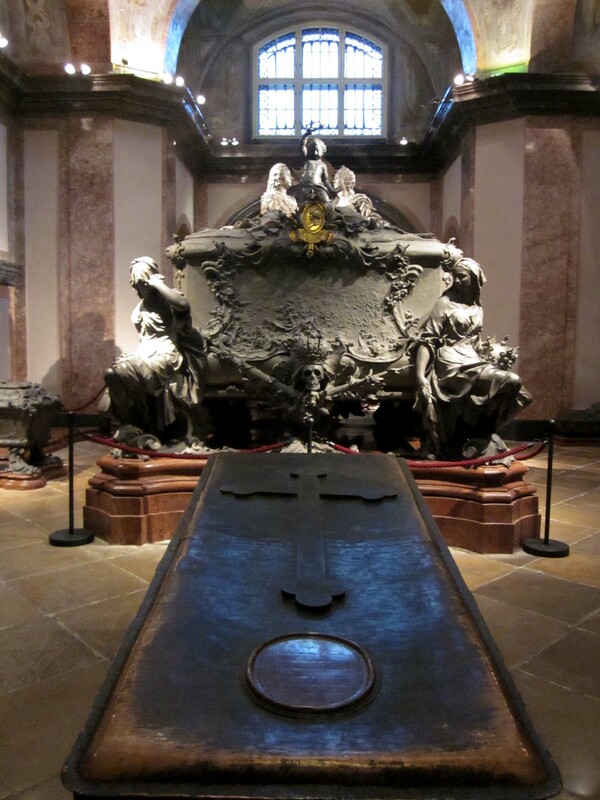 The largest of the sarcophagi is the one for Maria Theresa and her husband Francis Stephen of Lorraine. Maria Theresa is on the left and her husband on the right. They were very much in love and when he died first she would visit him in the crypt until she could no longer walk. Together they had 16 children, probably the best known being Marie Antoinette. Maria Theresa was a very forward thinking ruler and she passed many reforms that benefitted her people. 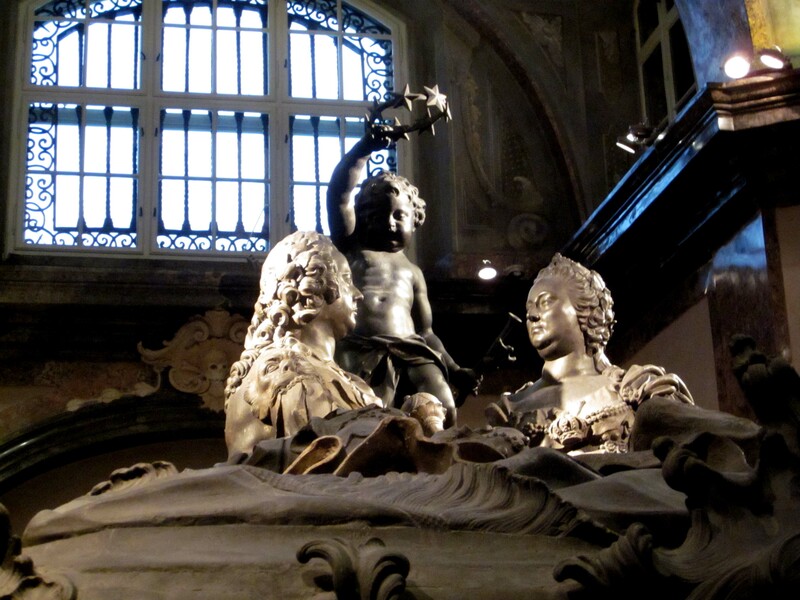 Just to the right of Maria Theresa is the simple sarcophagus of the nanny who took care of Maria Theresa’s children. 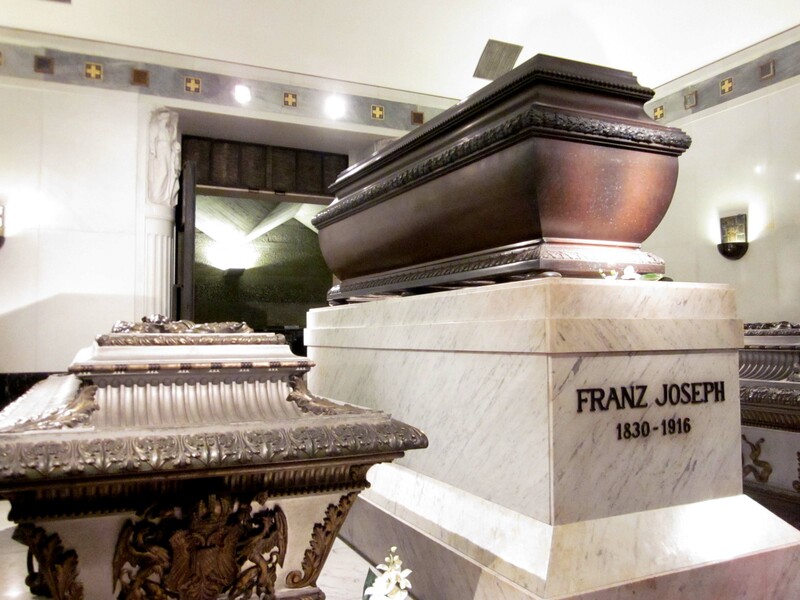 She is the only non-Habsburg to be buried in the crypt. In the background is the sarcophagus of Maria Theresa. 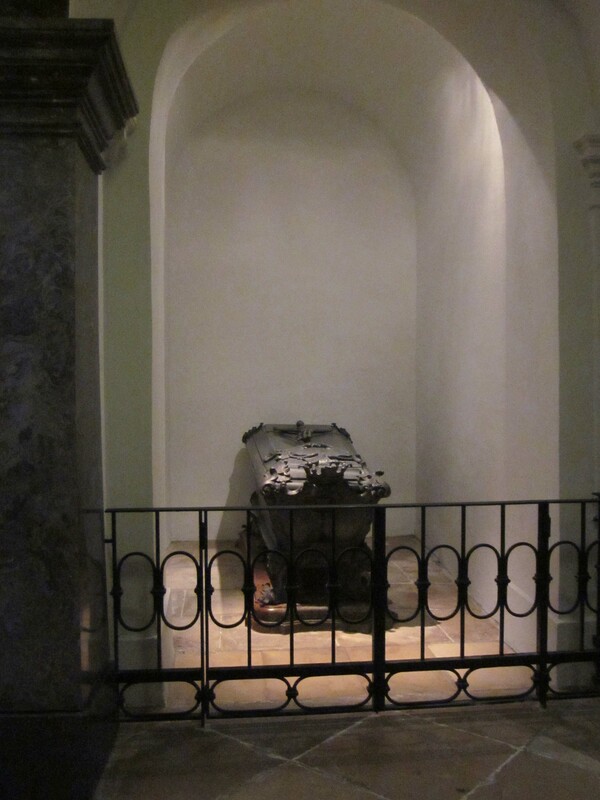 In the foreground is the sarcophagus of Joseph II, the son of Maria Theresa. They co-ruled for a time and when Maria Theresa died Joseph took control. He was one of the very first ruler that was truly of the Enlgihtenment and many would say far too ahead of his time. He was a very practical thinking man. He opened the Prater and Augarten in Vienna to the public, which as you can imagine did not make some of the more wealthy very happy and he abolished torture and serfdom. However, some of his reforms were too drastic for the time. He believed religion should be an individual matter and the church subservient to the state, which was hard for people to understand when the church had always been so involved in their lives. He closed down 700 monasteries, becoming so extreme that the Pope himself visited Vienna to make him stop. Joseph was also known for creating fake coffins, which had trap doors on the bottom so that the bodies could be dumped in the grave and the coffin reused without anyone knowing. Some believe that it is because of Joseph that Mozart’s body has never been found. 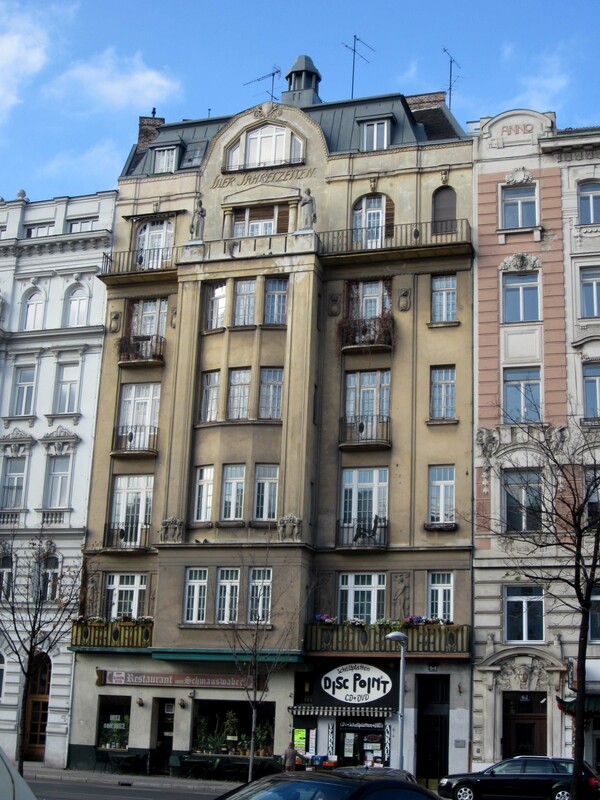 He also built a hospital for the poor in Vienna with a smaller building behind it for the clinically insane. This is the hospital in which I now have my German classes. 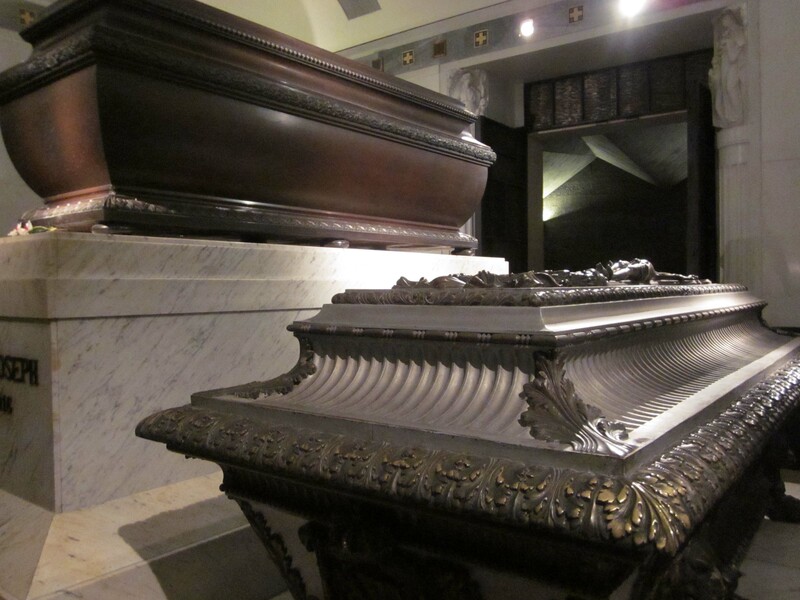 Joseph’s sarcophagus is lower than Maria Theresa’s because he was such a practical man and wanted to be at the level of his own people. Franz Joseph and his wife Elisabeth, also known as Sisi. Sisi was loved by many, especially Franz Joseph, but she never really loved him back. She spent most of her time traveling. She was a mediator between Austria and Hungary and helped to create the Austro-Hungarian Empire. She was killed by an Italian anarchist on one trip. Crown Prince Rudolf is to the right of Franz Joseph. He was one of the only Habsburgs to be tutored by someone other than a noble professor. He is said to have died on a hunting accident, but many believe that he killed himself. They also found a mistress dead with him. It is not known if he killed her or if she wanted to die with him, because she loved him so much. After WW I he was asked to step down and the Habsburg Empire was no more. He was exiled to Switzerland, but always had a dream of coming back to try to reclaim his “rightful” place. 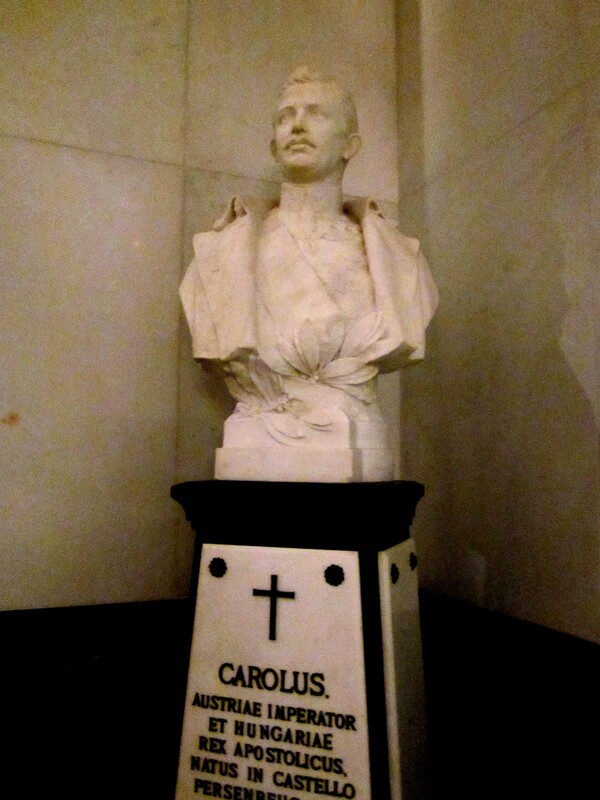 His body is not in the crypt because of his exile. It’s getting down to the last month of my stay in Austria. I can’t believe how fast its gone by and time is only going to get faster and faster. This particular week we were given our essay assignments. Two essays that need to be 10 pages long. It doesn’t sound too hard, but when there’s so much else to do it’s difficult to sit down in my room and do research. Lucky for me one of my essays in on the Art Nouveau movement so I’ve been able to go to some of the museums and see the art I’m talking about first hand. 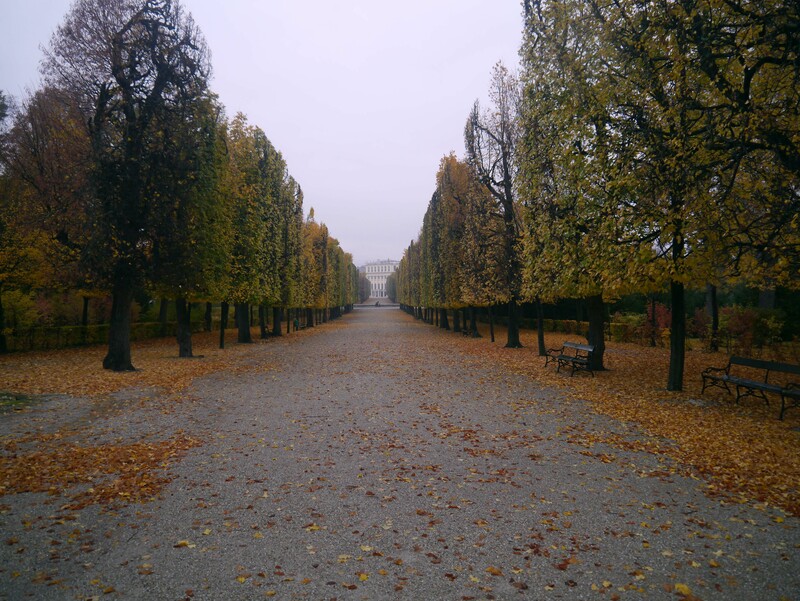 Another one of our assignments is to take a tour of the inside of Schönbrunn, which I’m happy to have an excuse to visit! 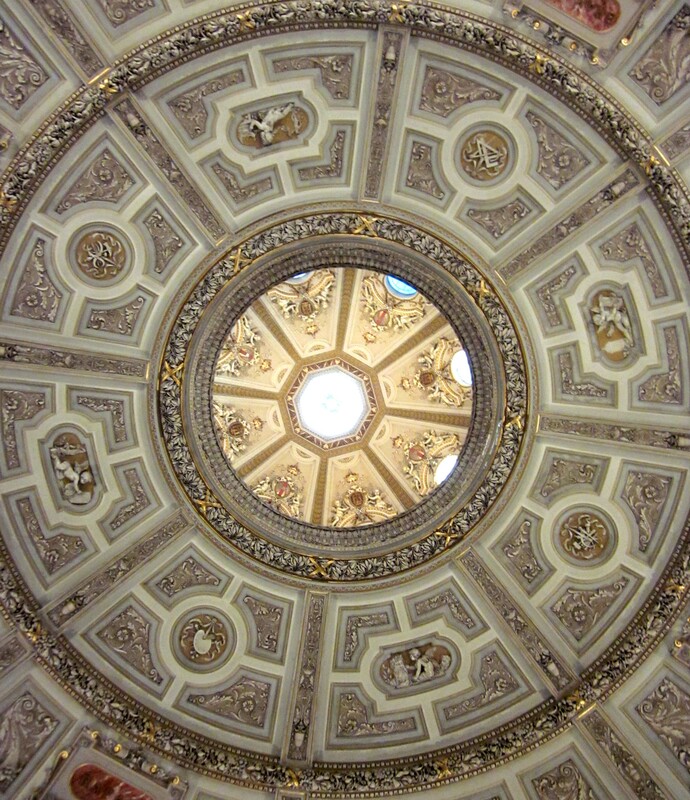 On Wednesday we took a tour for our class in the Kunsthistorisches Museum. It hosts Egyptian, Greek and Roman artifacts, as well as the private collection of Rudolf II, he was a huge patron of the arts, and it hosts paintings from the Baroque and Renaissance periods from all over the world. Although the paintings by Rembrandt, Rubens and Dürer were incredibly impressive, I can’t get over my love for the work of the Egyptians and Romans. The collection they house at the museum is very impressive and the museum itself could even be considered art. The ceiling of the museum. The second floor has comfy red seats around the open circle where people can get coffee. 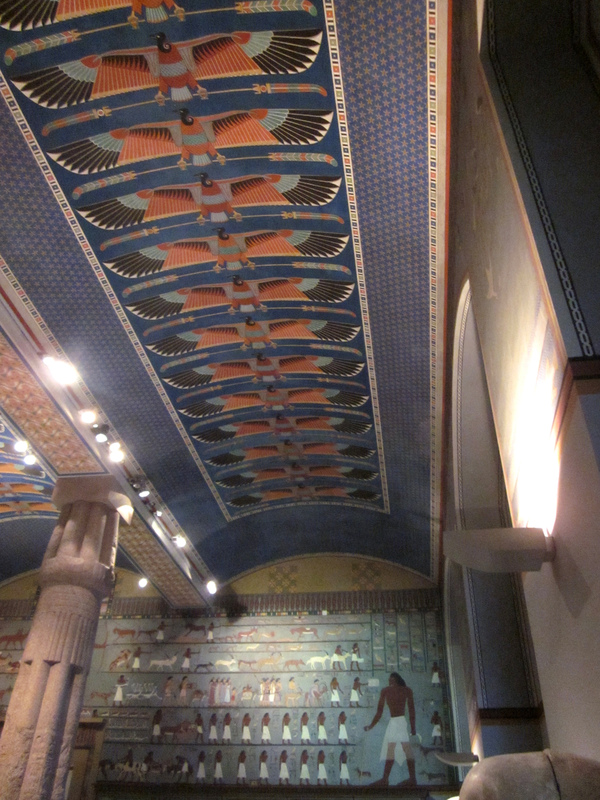 The hall that the Egyptian artifacts are in. In the collection they had statues, tablets, coffins, and also mummified animals. 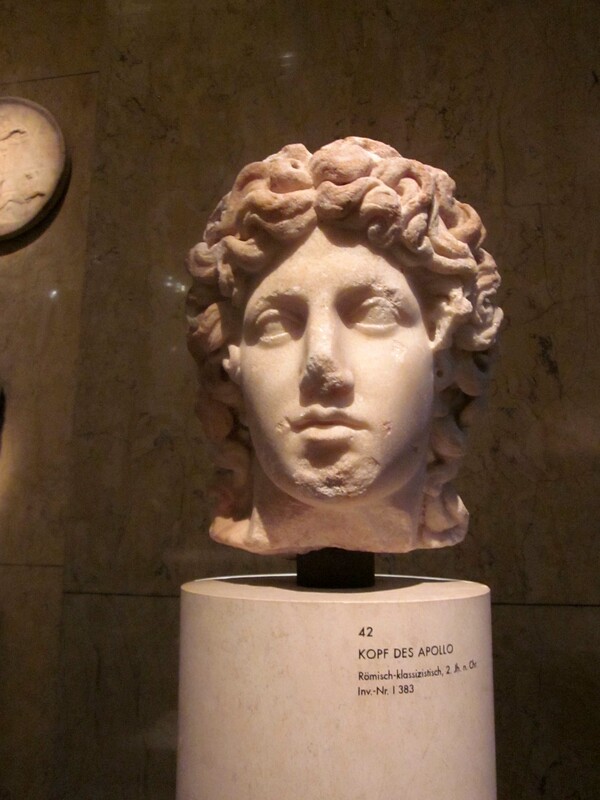 After the Egyptians came the room filled with Greek artifacts, mostly statues of gods. 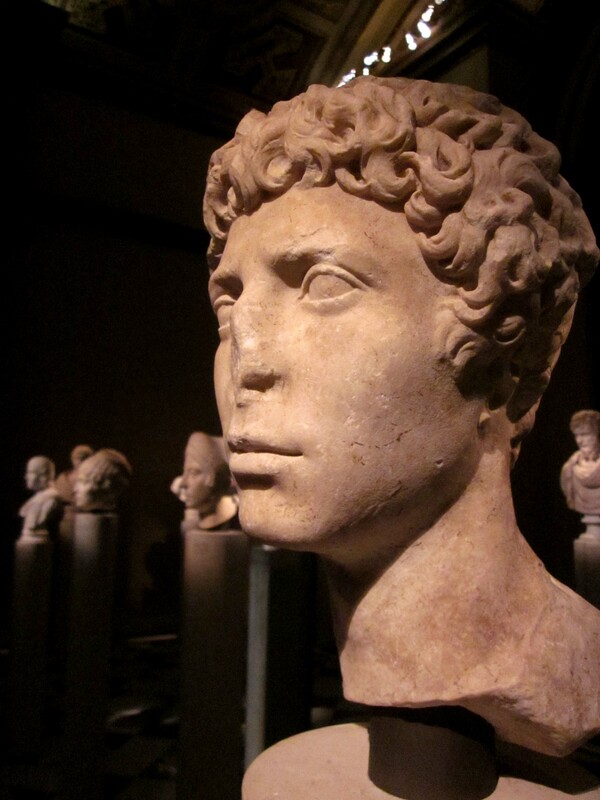 The stone statues of Roman Emperors. 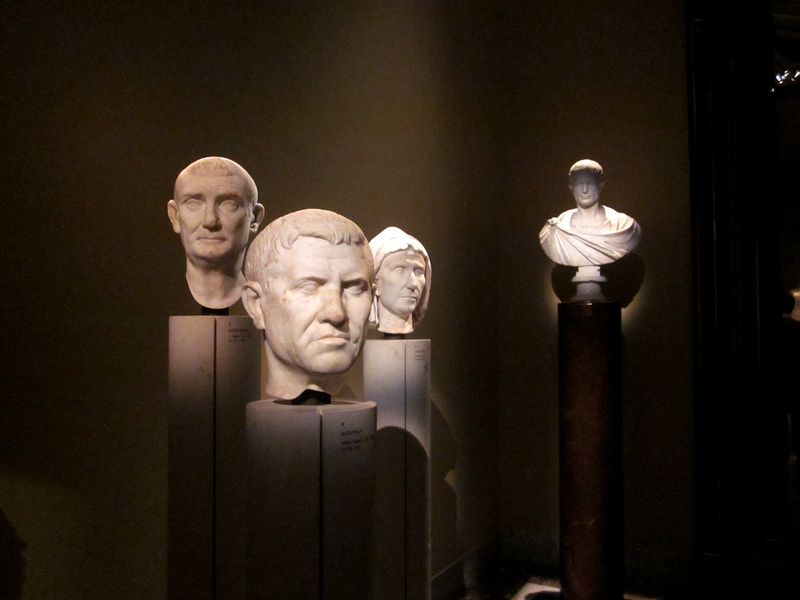 There were two rooms full of these busts. I loved seeing all the different emperors and remembering what I learned about them in school. 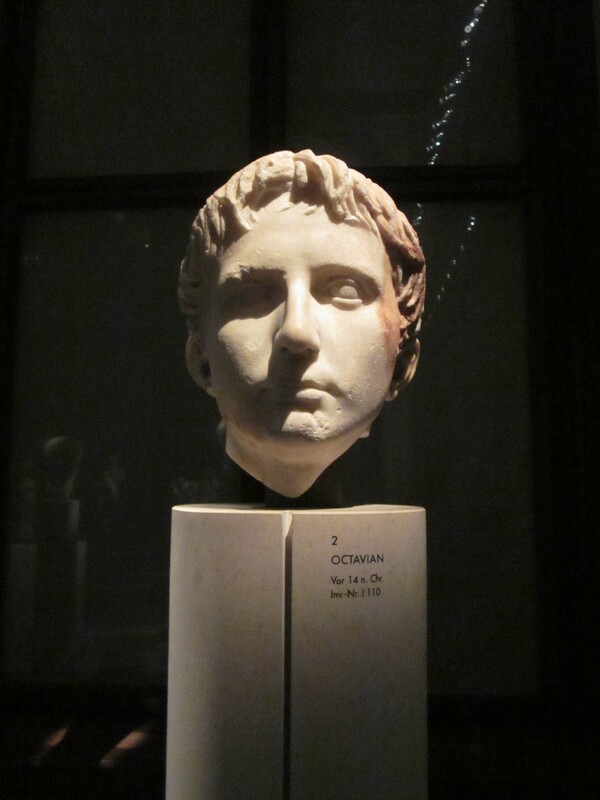 The bust of Octavian, later he changes his name to Augustus and becomes the first Roman Emperor. He brings peace to the Empire for a short time. The bust of a random man. Some of the labels for the heads were funny. 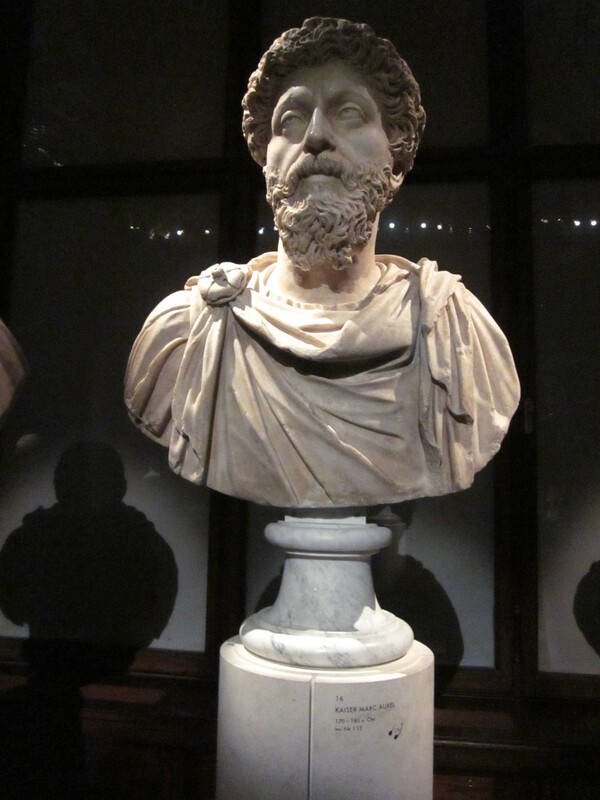 If the statue had a beard, but it wasn’t someone famous, the label would read, “head of bearded man”. I’m glad they wrote that down, because otherwise I probably wouldn’t have been able to tell. Marcus Aurelius. He was the last of the good emperors and is said to have died in Vienna. 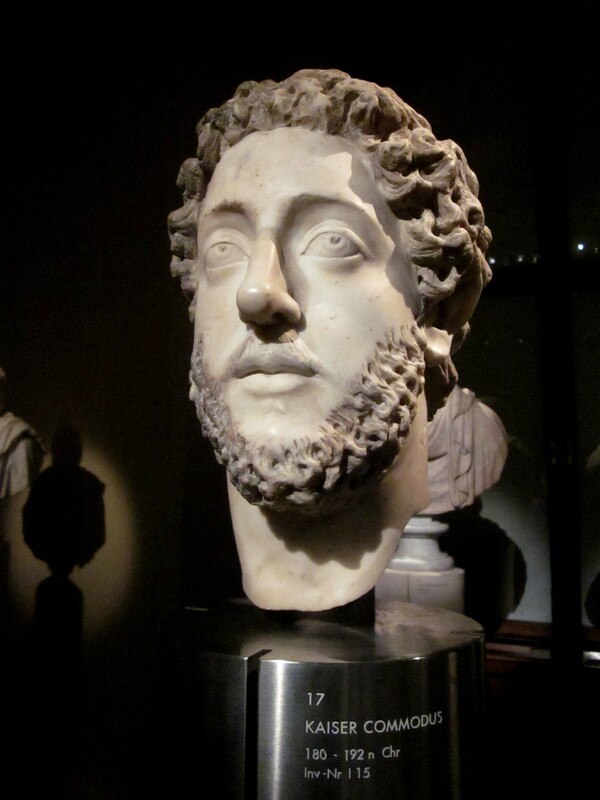 Commodus. He liked to participate in the gladiator games, which was something emperors never did before. He was a little crazy, but not the craziest unfortunately. 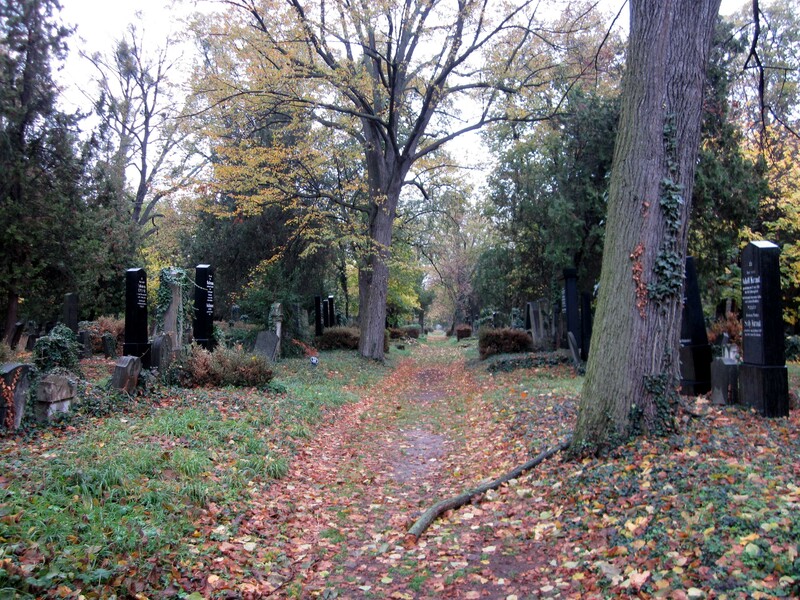 The first day of November is Allerheiligen or All Saints Day, which means that everything is closed. Since it was on a thursday we got the entire thursday and friday off. We’ve been learning about the culture around the dead in Vienna, which is little different from other places. Here, death is something that goes hand in hand with life. In Vienna, the funeral processions used to be huge celebrations with music, horses and carriages. 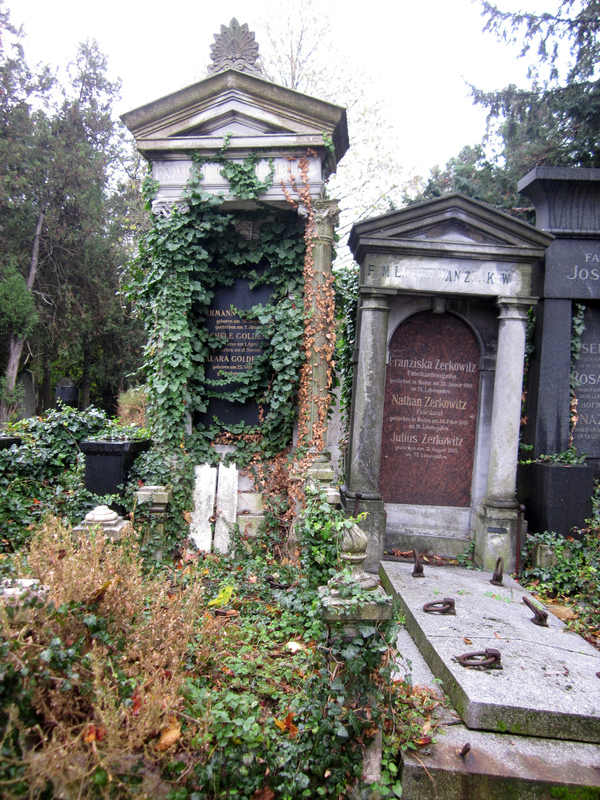 I figured that since death was so important to people in Vienna, it would be a good day to travel to the Zentralfriedhof or the Central Cemetery. Although I didn’t know anyone at the cemetery, I thought it would be a good day to simply remember the dead and think about my own lot in life. The cemetery was so large we were really only able to walk through about a quarter of it. As we walked further towards the back, the graves got older and many of them no longer had anything carved into the headstones. Some were so cracked that they had basically fallen apart and were completely covered in vines and leaves. In the cemetery main roads were paved, but there were also smaller paths that wove throughout the graves. It was a cold day, but quiet and peaceful. Friday we had our big night at the Opera House. Earlier in the year we bought tickets for the ballet, Romeo and Juliet. 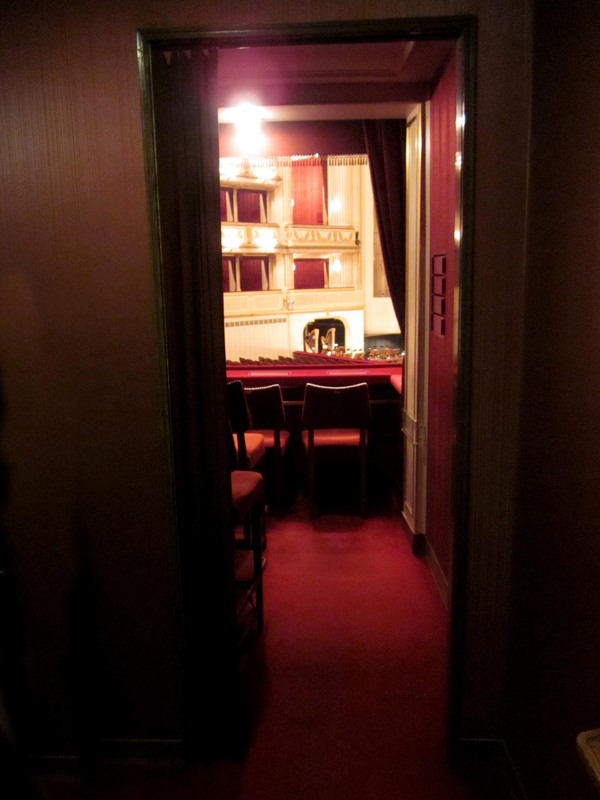 Our seats were on the second floor in a small room with five other people. We all felt really fancy siting in a semi-private booth. The ballet itself was really good. The costumes were amazing and the scenery was really well done. However, It was funny to see Romeo and Juliet in a ballet form. Shakespeare’s work is almost entirely dialogue, which makes it all the more impressive that they were able to pull off a ballet, which has no words at all. Sometimes, it was hard not to laugh when Romeo and his friends are hopping around stage and many of the death scenes were almost too dramatic. The characters would take at least five minutes to die, sometimes even rolling around on the floor to add dramatic effect. The entrance to our semi-private room. 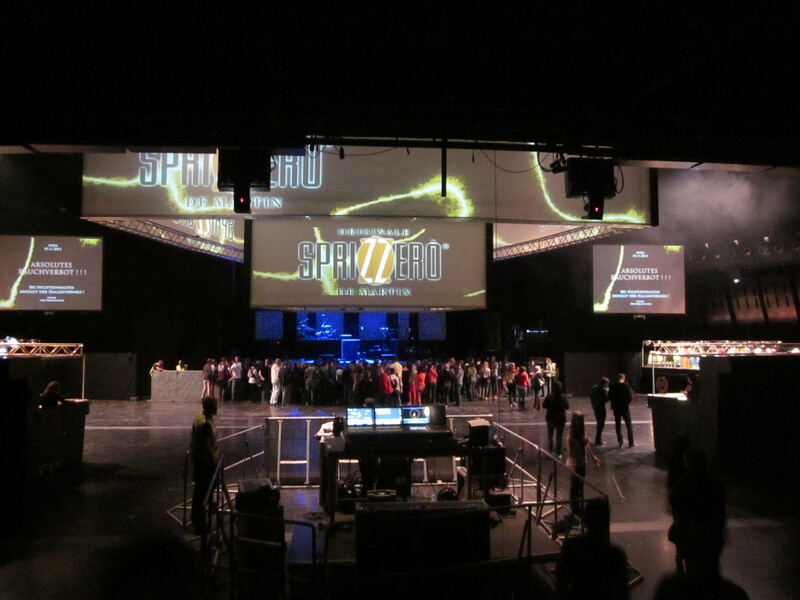 The view of the stage we had from our seats. Saturday, Annika and I went to Naschmarkt and realized that it actually goes a lot further than we thought. Once we got past all the food, we found scarves, hats, tapestries, and shirts. For months I had been wondering where these things were, because every other city had them, but I never thought to venture further into Naschmarkt. The U-Bahn rail at the end of Naschmarkt. There were some very cool houses at the end of Naschmarkt. 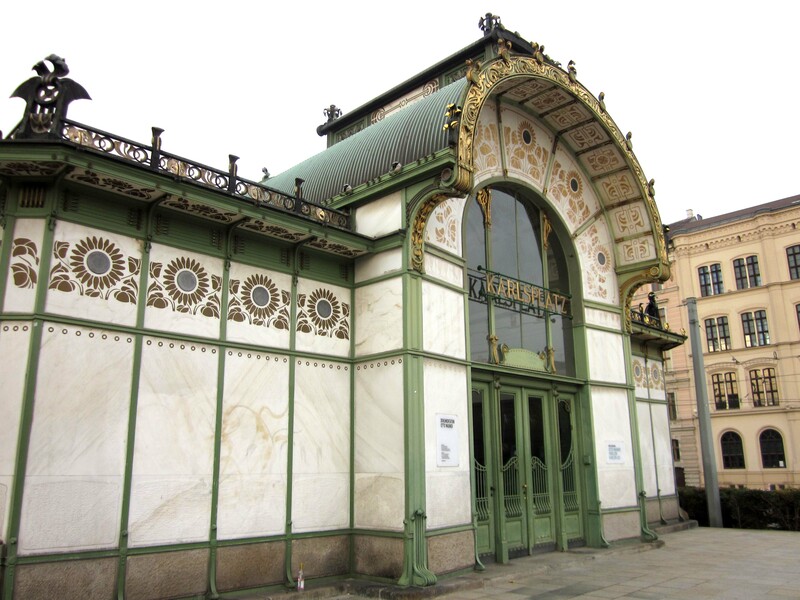 The one below was designed by Otto Wagner, a famous architect of the Art Nouveau movement. Fall is one of my favorite times. Fall means family and friend time, pumpkin pie, hot chocolate, sitting by the fire and watching movies. Outside it means that the leaves are changing and the trees are at their most beautiful. 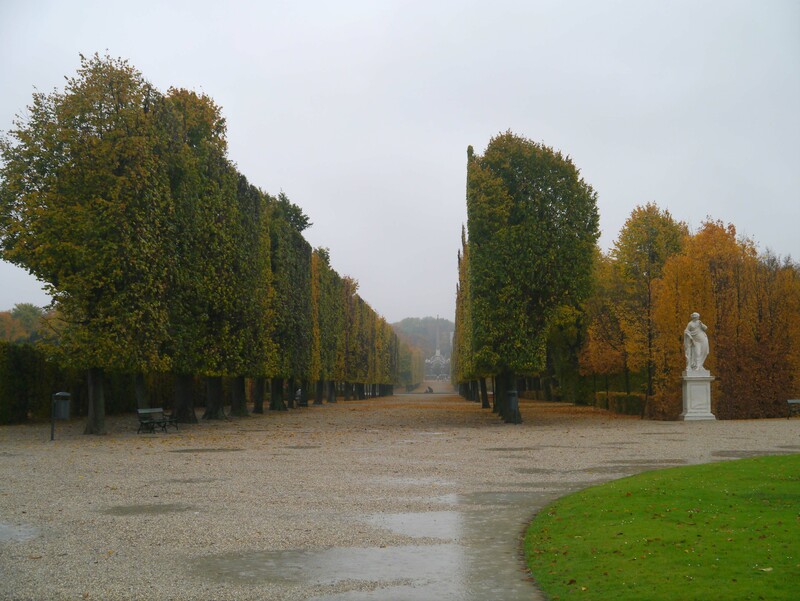 When I woke up in the morning it was raining and really not the best day to walk around outside, but the weather will probably only get worse, so it was off to Schönbrunn! Annika and Nick accompanied me this time. 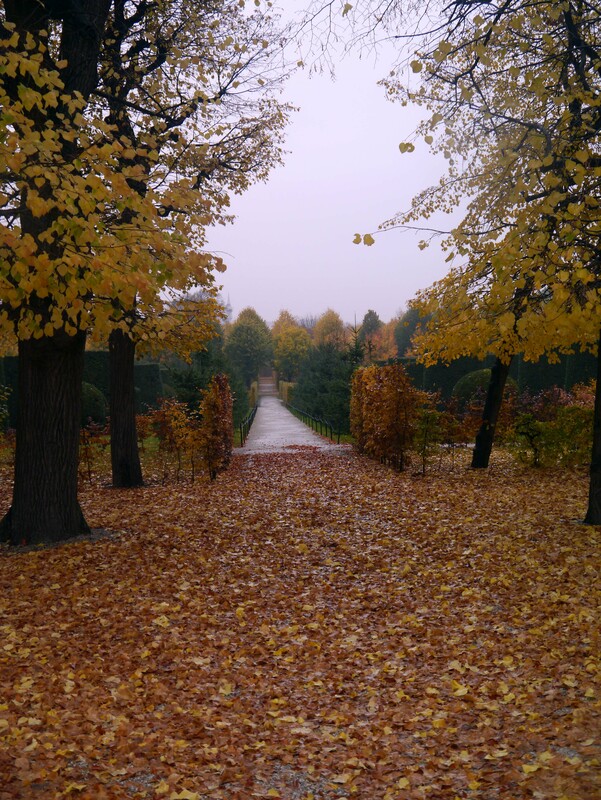 When we arrived, the palace was almost completely deserted and it started to pour, but overall it was a wonderful walk in the gardens. Later that day Annika and I went shoe shopping and found a great deal, then we all went out to see a movie. On the way back to my house the rain was coming down hard and it stung my face like sleet. Everyone says it’s supposed to snow tomorrow, so we’ll see! It did snow the next few days, mostly outside of the center of the city, but I did get to see a few flakes as I was walking to class. 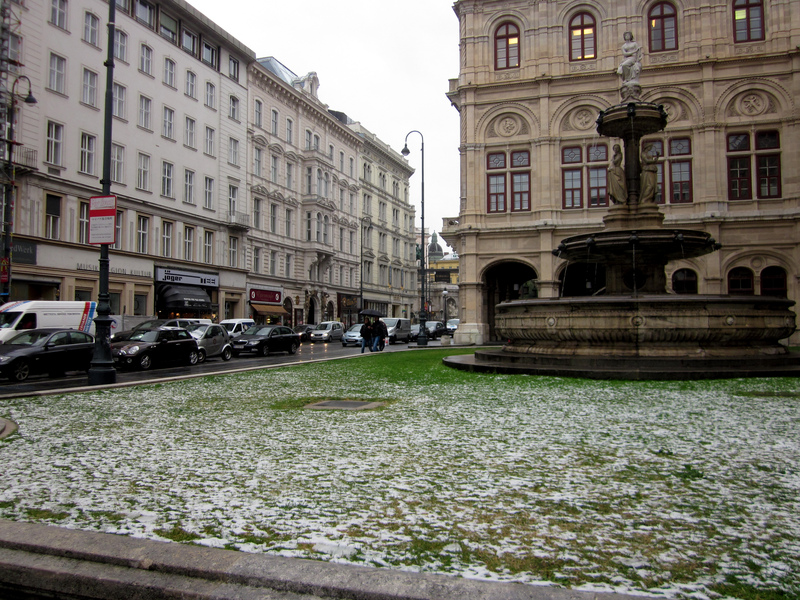 The little snow remaining by the Opera House. One night after a long day of midterms and studying, we were given the opportunity to go to Puls 4, a TV news station in Vienna, and sit in the audience for a debate over the presidential election in America. It took us a long time to find the station, basically our instructions were to step off the Straßenbahn and turn left, but left is a word that can be interpreted in an umber of ways! Eventually, we found a nice man who took out his phone and researched the address for us. Turns out we were pretty close. Getting a behind the scenes look at how a news station runs was amazing! We arrived and there were food and drinks set out for everyone. We all stood around for a little talking and getting our make-up done, the men too, until one of the interns asked us all to move into the studio. The studio was actually really small and we were only sitting maybe a few feet from the main stage. They gave us all exact spots to sit in. I was sitting by another man who came from America, but had lived in Austria for about 30 years. 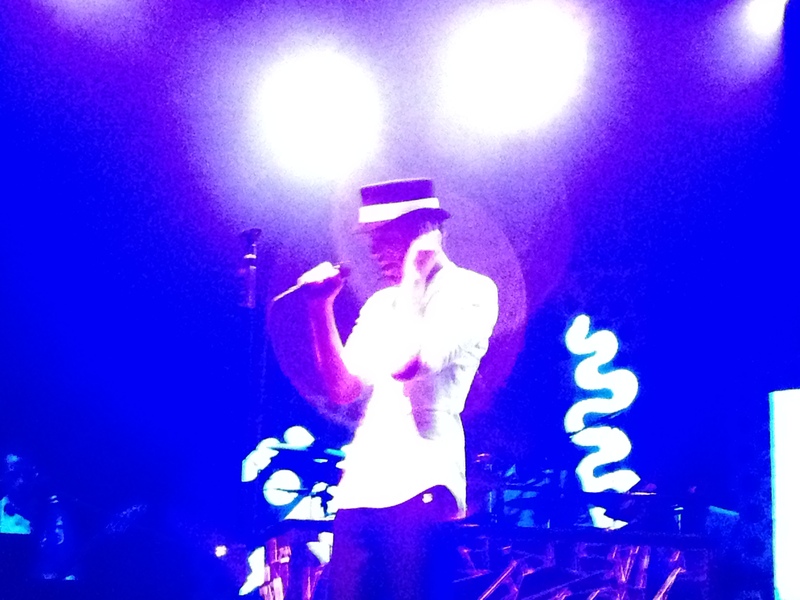 We chatted quietly before they signaled everyone to be quiet and then the show started. It was very hot under the stage lighting and I was trying very hard not to blink too much and have a pleasant look on my face when the camera scanned the crowed. All the cameramen worked smoothly together and they were constantly moving around to get the best shot, sometimes they even blocked the audiences view of the stage. Whenever we needed to clap there was someone placed in the audience who was there to initiate the clapping and it was funny listening to the 30 second pause before everyone else started clapping too. Going back to video and watching it again, I could not tell there was any pause and most of the time the audio from the audience wasn’t captured unless there was a mic on one of the audience members. The actual show was a debate between people for Romney and people for Obama. The guests consisted of a woman who worked for Ronald Reagan, the chief director of the magazine “Liberal”, a journalist from “Der Standard” and a political strategist. Sometimes I had a hard time understanding the German being spoken, but for the most part it was actually easy to understand. It was really a wonderful experience to be on Austrian TV and at the same time get a glimpse into how people outside the US view American politics. See if you can find me! 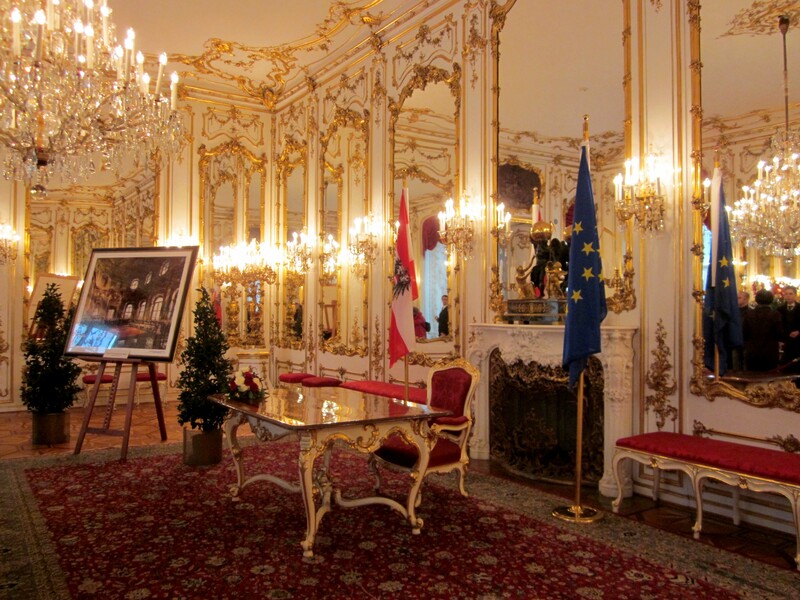 Friday the 26th of October is Austria’s national holiday celebrating the declaration of Austria’s neutrality after WW II. 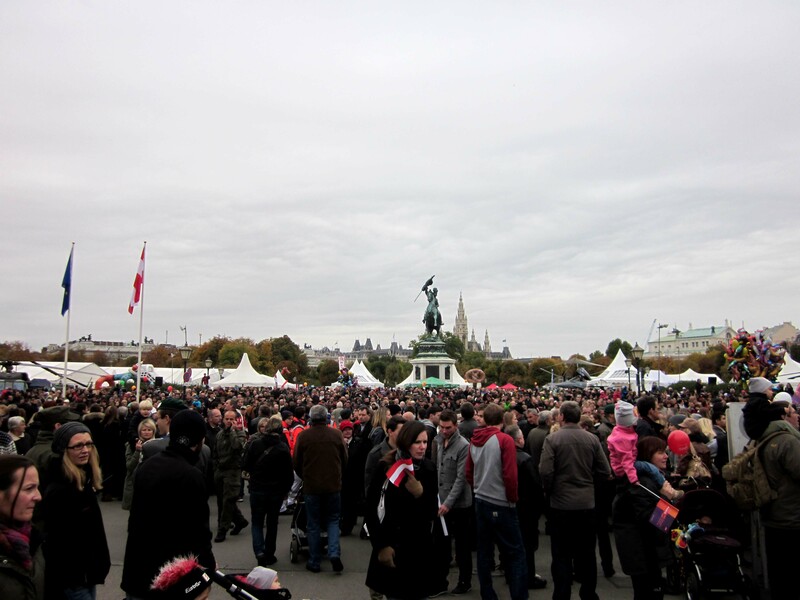 On this day a number of events take place, the biggest being a celebration on Heldenplatz. Below is the Justice Building. It’s not on Heldenplatz, but it is significant, because it was set fire to in the 1920’s, because of differences between two of the major political parties in Austria, the Christian Socials and the Social Democrats. The building was mostly destroyed and the government sent police to stop the riot. The police ended up firing on unarmed protesters. This was one of the events that contributed to the end of the First Republic of Austria, on of the main problems being that each party distrusted the other and both of them had their own private army. 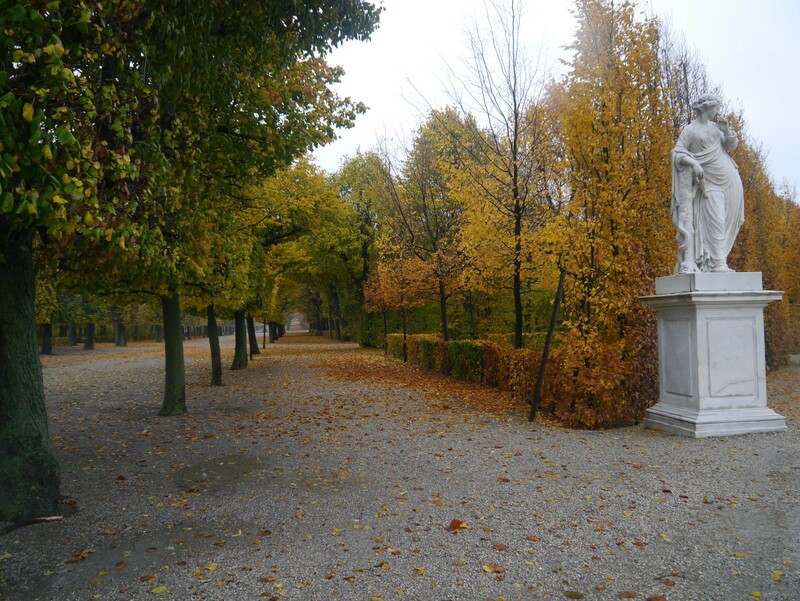 Heldenplatz is located in front of the Hofburg Palace, the winter residence of the Habsburgs. It now houses a number of different things, such as the national library, the office of the Federal President and also the office of the Chancellor. In all it has around 11 different sections. 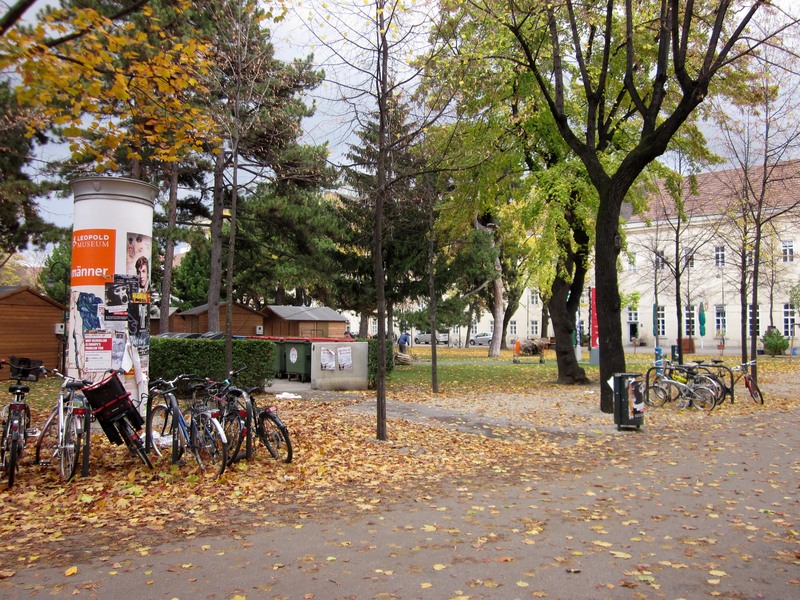 In the past, this was the square where Hitler gave his speech after Germany invaded Austria. It’s a little scary thinking about what happened on this square not so long ago, but the celebration held today is one of peace and neutrality, not one of fear and hate, which makes all the difference. 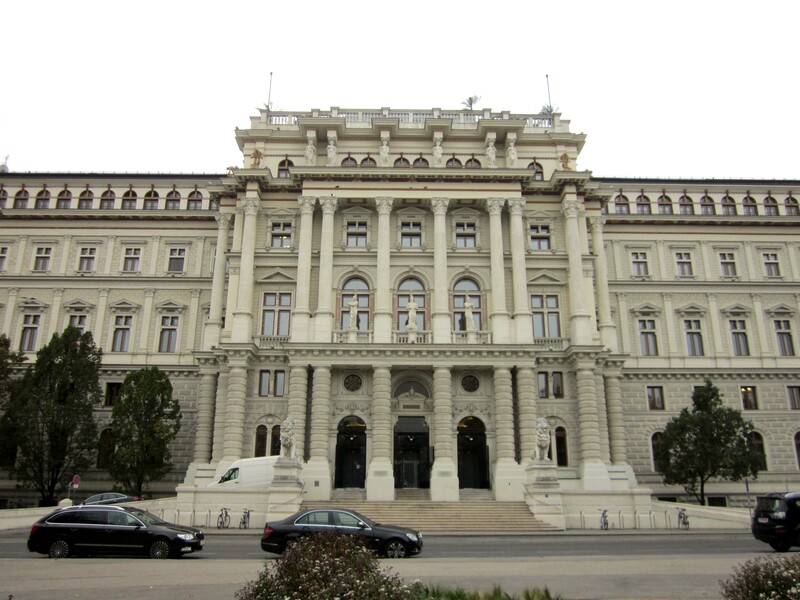 On October 26th, all the doors of the official buildings are open, like parliament, the Federal Chancellery, and also the president’s office in the Hofburg Palace. In the square are also food stands with Bratwurst, glühwein (which is hot, spiced wine), and breads. 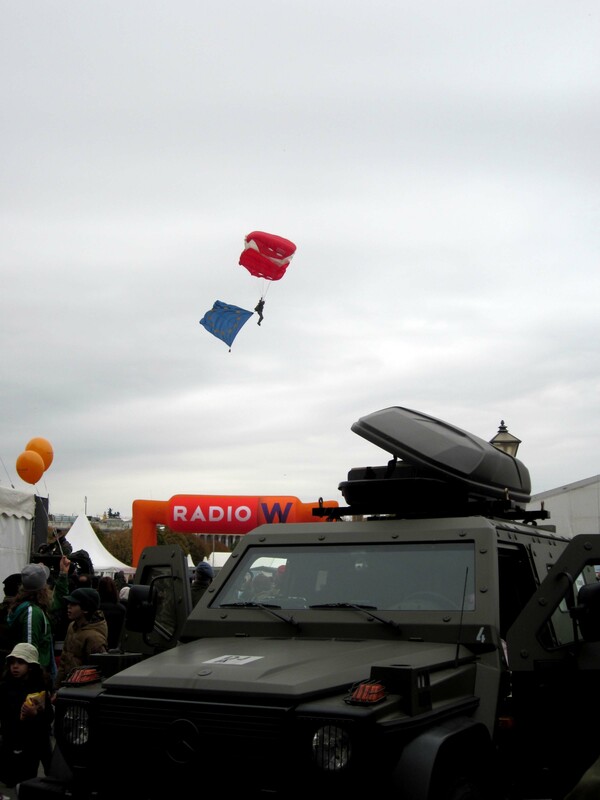 All around the square sat tanks, helicopters and other vehicles in the army of Austria. It was interesting to see the army celebrated in a different way than in America. After World War II, Austria became a neutral country, so the military is seen in a different light in Austria than in America. 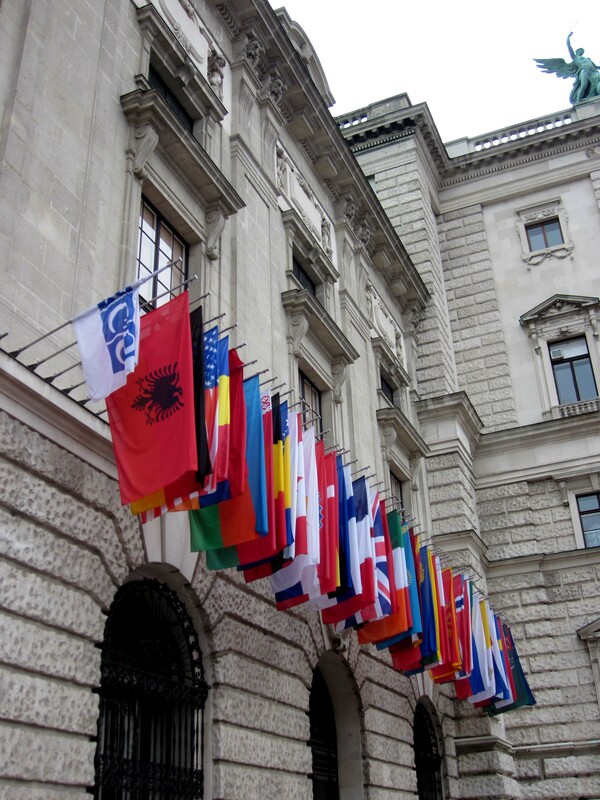 Flags from all different countries, decorating the side of the Hofburg. 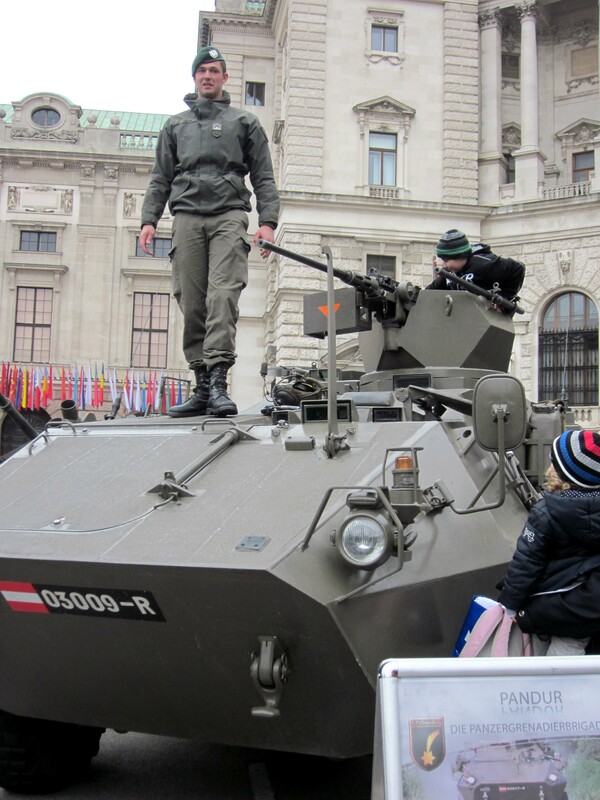 An Austrian soldier walking on a tank. 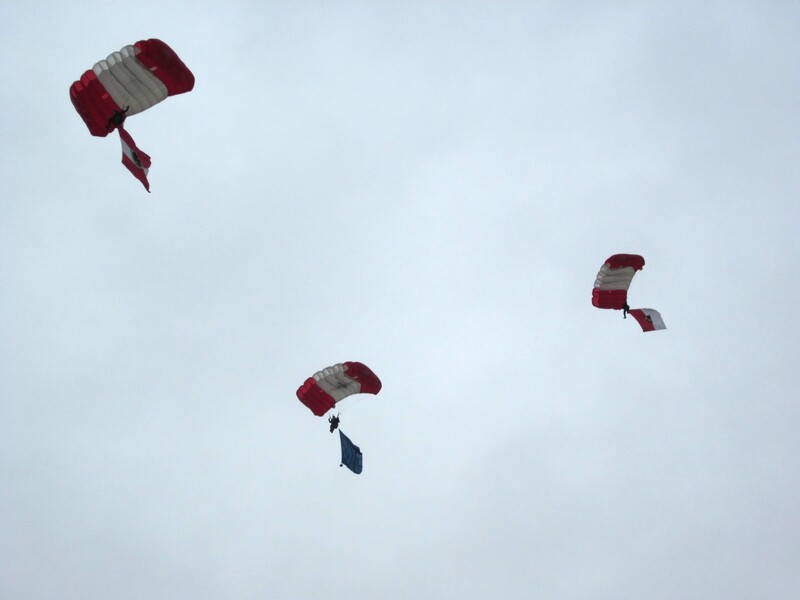 There were soldiers jumping out of a helicopter when we arrived and they parachuted down onto the square with flags trailing behind. The day before the celebration our politics professor told us that it might be possible to meet the president, because of the Day of the Open Door, which accompanies the national holiday. We really had no idea if it would be possible, but decided that we would maybe try to meet the president if the opportunity arose. We wandered through the square admiring the tanks and helicopters, but soon became hungry, so we all tried different Bratwürsts and drank some glühwein, which was nice on a cold day. Afterwards, we headed towards the side of the Hofburg Palace, because there seemed to be a lot of people standing around there. There were two lines to get into two different buildings. We really had no idea what each line was for, but we had a hunch they might be to meet someone important. At first we stood on the right side of the square, but it was a long line, so on a whim we decided to switch to the one across the square. It was only after we walked up closer to the line that we realized it was to meet the president. We were surprised, because it was so short, but a sign on the door told us that we were about an hour early. The opportunity was too good to miss, so we decided to wait. Before meeting the Federal President of Austria, we were given a short tour of the president’s wing in the Hofburg, called Leopold Wing. 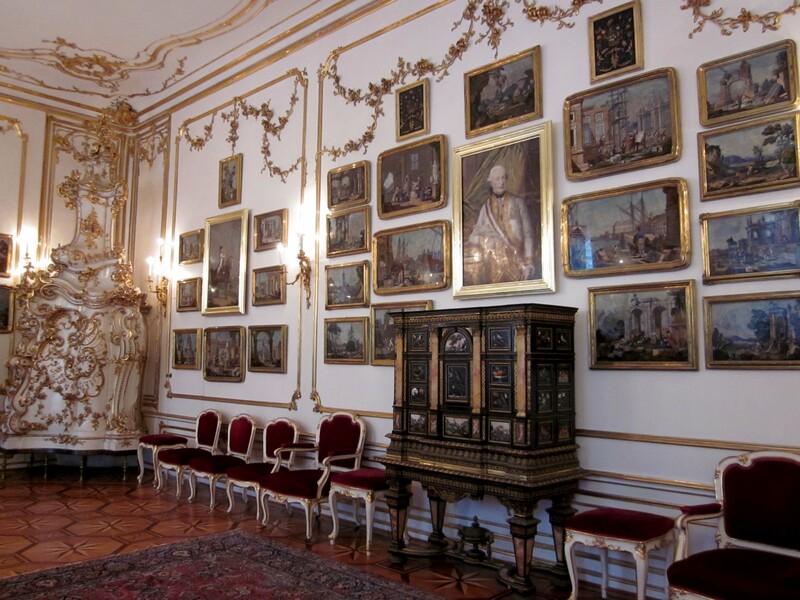 It was decorated in the Baroque style with a number of images of Maria Theresa and her husband on the walls. One room was entirely filled with “paintings”, which on closer inspection are actually images made out of stone. The room below seemed like the office of the president, but he probably only uses it for official reasons, because a much less decorated desk was only two rooms down. Finally, we came to the president, luckily we were early in the line, so he was still chipper and happy to meet us. No one wanted to go first, so I went and shook his hand and stumbled over some sentences in German. He was really nice and asked where I was from in America and what I was studying. He wished me success in life and joked around a little about the upcoming presidential elections in America. His wife was right next him and I got to shake her hand too. Heinz Fischer the President of the Republic of Austria and me! After everyone had made their way through the line we headed back outside to be greeted by Austria’s military band. While we were listening we ran into Clifford, one of the other students staying with Addison, and together we decided to wait in line to see the Chancellor. The visit with the Chancellor, Werner Faymann, was a little different. Each room had its own self-guided tour and it felt more like an office building. While we made our way through the building the Chancellor was walking around the different rooms, rather than standing in one spot. We took a picture with him and then he made his way to the next room. We were supposed to receive our photo with him once we exited the building, but somehow it got lost along the way. 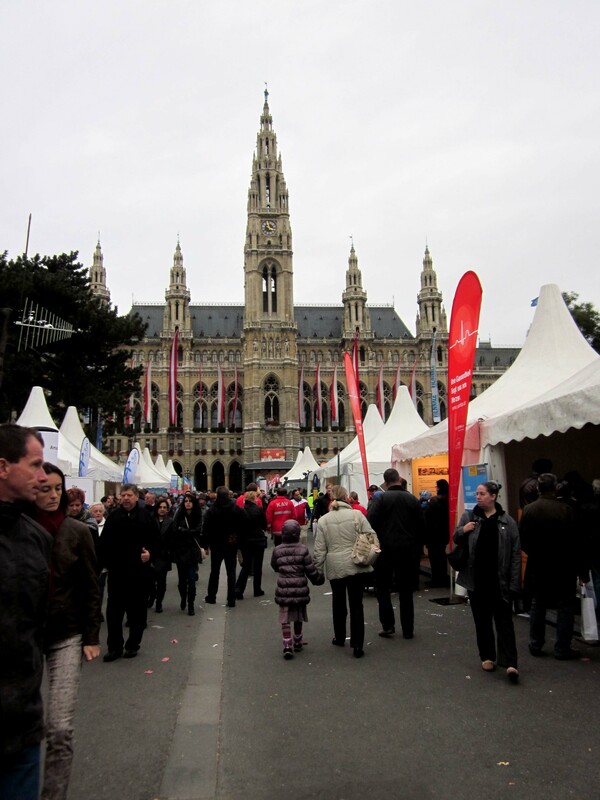 We separated ways soon after, Annika and I headed over to the Rathaus, which was covered in tents advertising different occupations. Currently, for men 18 and up, it is required to either go into the army or go into some sort of social service. This however, is being contested and may change in the near future. Later that night we went to Addison’s and cooked a nice dinner, before watching the last presidential debate over the internet, because we were unable to watch it on TV. 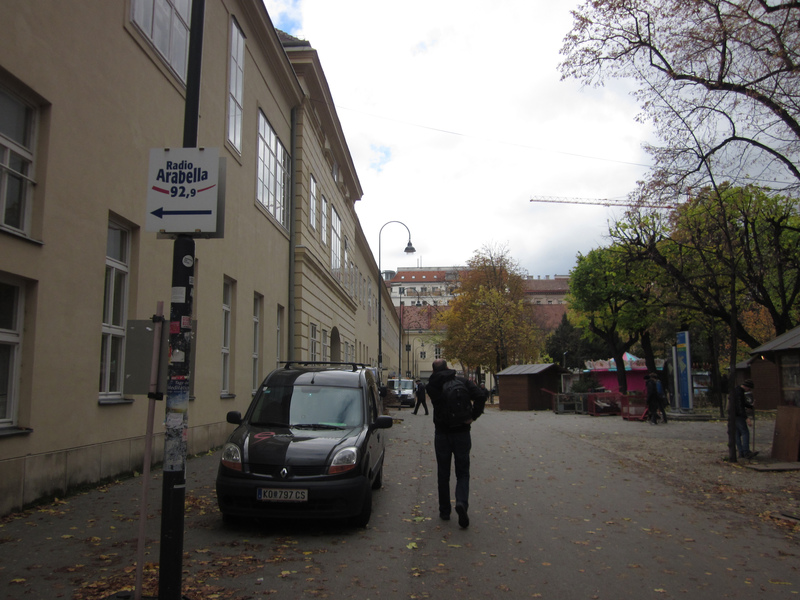 We started classes at the University of Vienna a couple of weeks ago. Our classes aren’t at the actual university building, but instead in the old city hospital, which when you think about it is a little creepy! Inside the building it’s easy to tell that the building was once a hospital, but outside there is a nice courtyard, with small pubs and during Christmas there is also a small Christmas market, which they’re preparing for now. Inside the “University”. 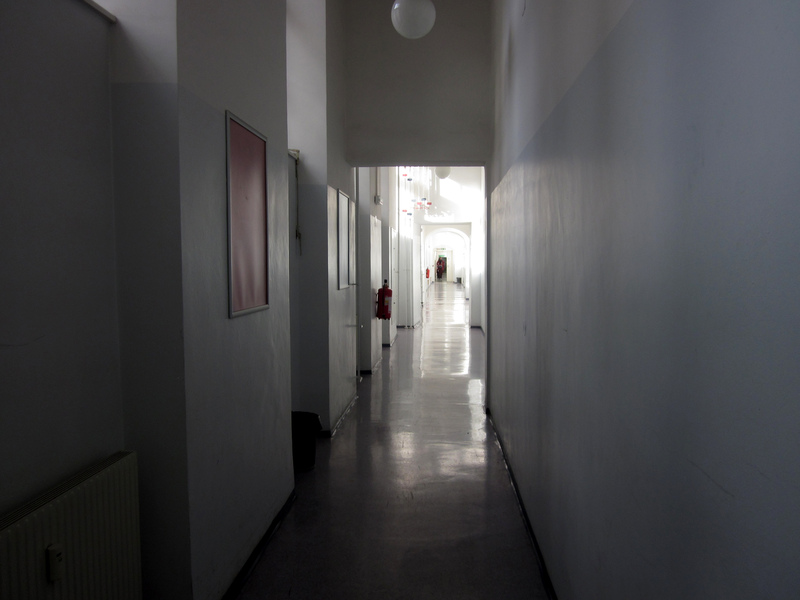 It’s easy to tell it was once a hospital, because of the long white halls and empty rooms. From the outside the building is pretty plain, but the courtyard just out front is really nice. The Weihnachten, or Christmas stalls. They are being set up in the courtyard to prepare for the Christmas market. There are also similar ones in front of the Rathaus. Our classes have been amazing. Our professor is very cool. Often times she looks like a cross between a hippie-pirate, but she pulls it off. Annika, Addison and I are all in the same level, while Nick and Ari are in separate ones, but we sit apart in the class so that we don’t talk too much to each other. Most of the other students in the class don’t know one another and we are the youngest students there. Many of them are married with children and have been living in Vienna for a while. The best part about classes is hearing from everyone’s different point of view. We have people from Italy, Romania, Iran, Hungary, the Czech Republic, Russia, Spain, France, China and Turkey. It’s so interesting to hear about their different lives, the reasons for them moving to Vienna and their outlook on the world. Everyone in the class is eager to share their experiences and the best part is that in the classroom, we’re all equal. Everyone is just trying to learn. *I’ve had classes for about a month now, but I’ve been so behind on my posts! The lectures are still going great!